With our garage being my workshop and our primary storage area, it was filled to the brim with tools of all sizes, boxes and boxes of holiday decorations, yard tools and toys, and so much more. 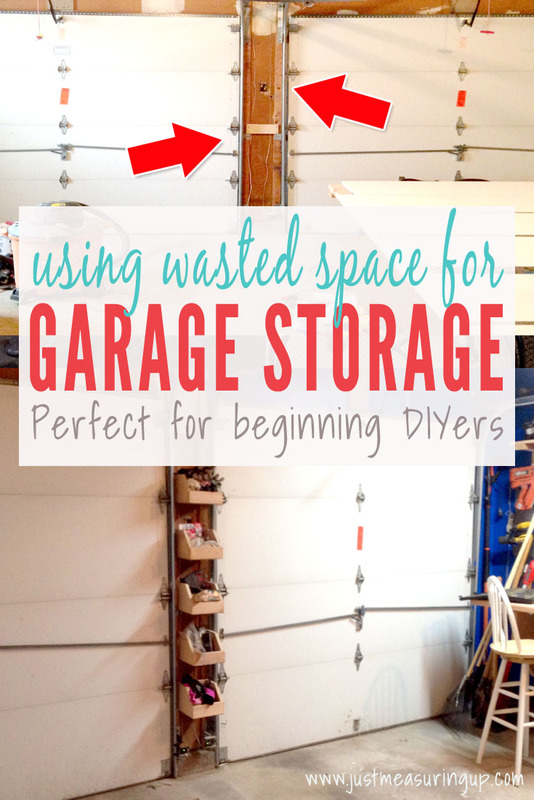 We already did a lot of DIY projects that saved space and created more garage storage. 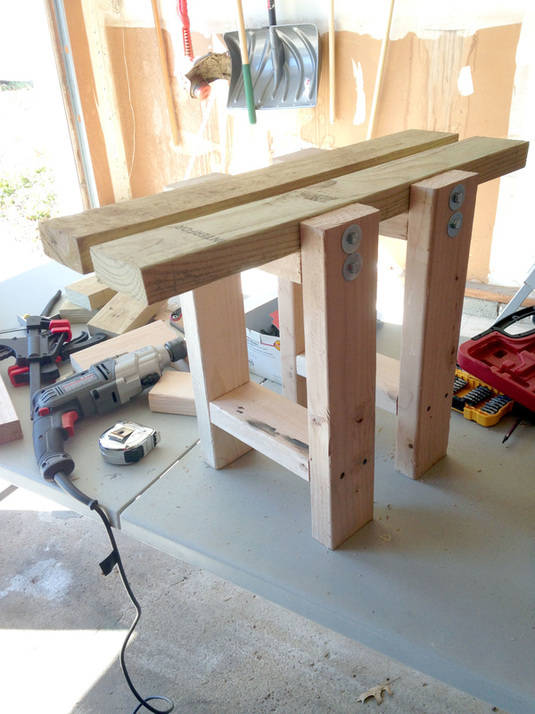 I constructed a folding workbench, which was such an efficient workstation. In a corner that formerly was a dumping ground of yard tools, I built a sliding shelf tower, which housed all of our holiday decorations. I also had a lot of creative shelves scattered around. With so many things in our garage, any empty area was prime real estate, no matter how small. The other day, some wall space caught my eye – the gap between the two garage doors. Right away I thought that it would be an excellent place for some narrow shelves. Strange that it took me a year to spot the little gem between my garage doors that could provide more garage storage. Coincidentally, the project I was working on at the time (the built-in bookcase with window seat) produced a lot of scrap birch plywood. 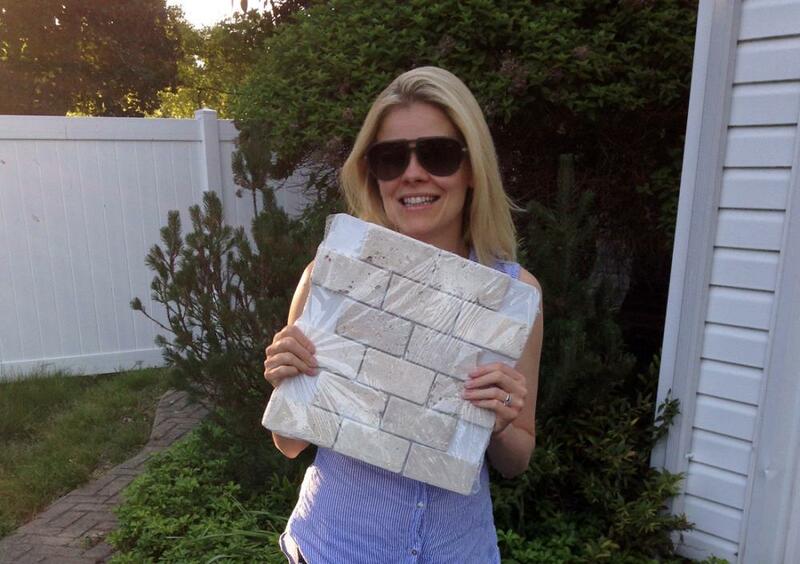 This was expensive stuff – 4×8 sheets sell for $50 at Home Depot. So I wasn’t wasting any cut offs (I was quite inventive in the different ways I reused those scraps). 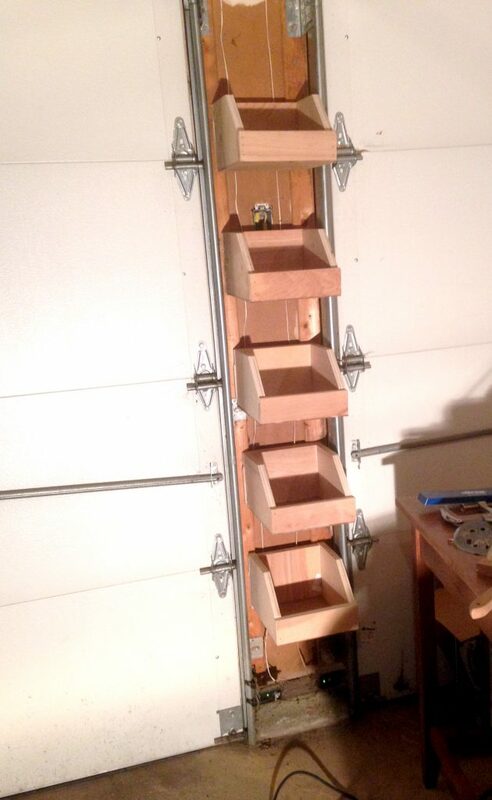 My shelving idea between the garage doors would be a perfect little project for some of the plywood scraps to get more garage storage. Simple flat shelves wouldn’t suffice though. With so little space, the shelves would be small, and things could fall off easily. So instead of shelves, I started visualizing little boxes on the wall. How nice would it be to walk in wearing yard gloves, and have a box to toss them into as soon as I enter the garage? I took the box idea a step further and considered using French cleats for them. This would allow each box shelf to be removed by simply lifting it. It would lead to a very modular design where the boxes could be swapped with other ones on the fly. Rather than digging through a box on the wall to find what I need, or make repeated trips to the wall, why not just take the box shelf with me? Not only would it create more garage storage – but it also would be very efficient. ​Now that’s some clever thinking, if I do say so myself. 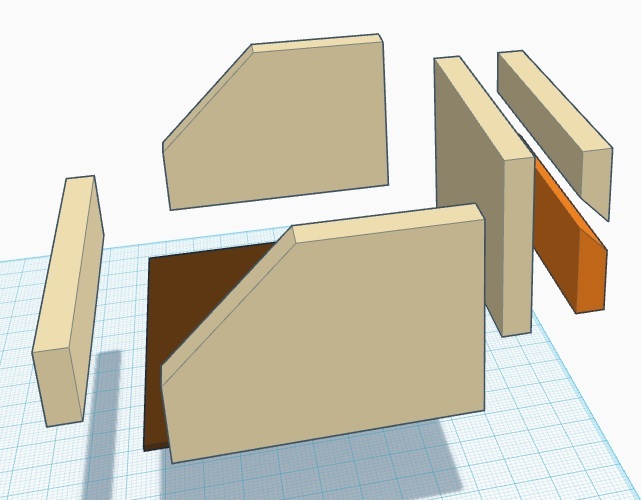 In the diagram above, the orange piece on the far right is mounted to the wall (to allow the box shelf to drop into and secure to the wall). The rest of the pieces form the box itself. 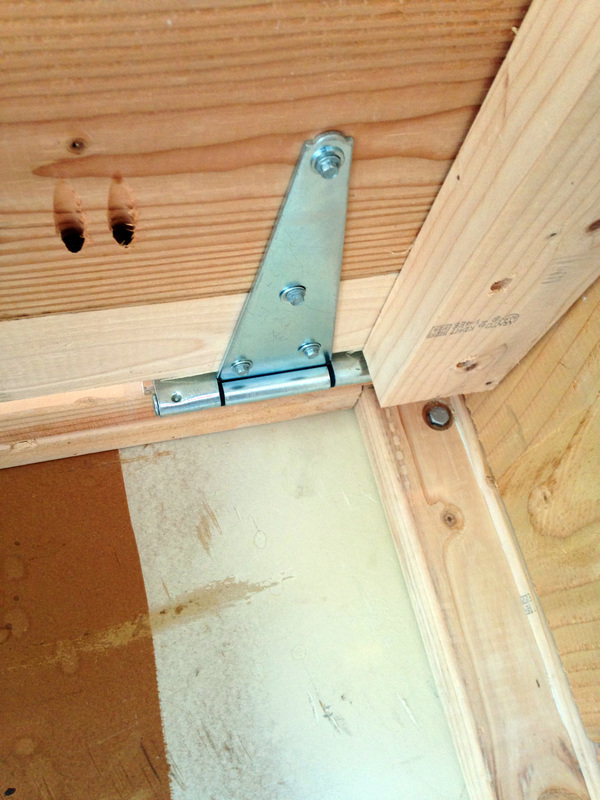 The wall mounted piece and the other angled cut directly above it (attached to the box) form the French cleat system. I used scrap ¾” birch plywood for the box and French cleats. For the floor of the box, I used ⅛” thick scrap plywood. I cut all the pieces to size quickly using my table saw, and then miter cut the side pieces for that nice angled profile. 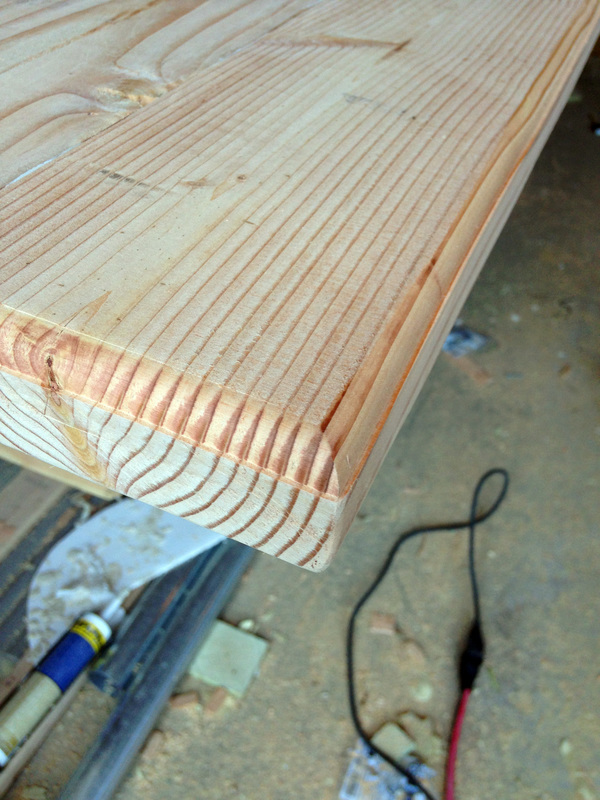 For the French cleat 45 degree lengthwise cuts, I used the table saw again. Then I used construction adhesive, some bar clamps and my 16 gauge finishing nail gun to assemble the wood pieces into a functional French cleat box shelf. Technically, I built the first shelf without the nail gun. I just used regular finishing nails and a hammer. With these types of shelves, the strength comes mostly from the construction adhesive (that stuff is really strong when completely dry). The nails really just hold the pieces in place for the glue to set. So that’s why I used finishing nails. Also, I didn’t want to risk splitting the plywood scraps, so finishing nails were a good choice due to their thin profile. 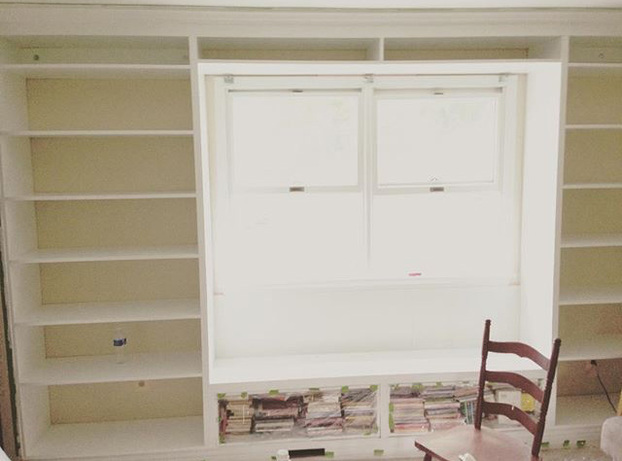 As I mentioned earlier, I was in the middle of a bookcase/window seat project at the time. Part of this project involved installing crown molding and baseboard. I remembered installing crown molding in my previous home, and having an incredibly hard time doing it with finishing nails and a hammer. So, I ended up borrowing my neighbor’s cordless finishing nail gun, and the installation was such a breeze. I just held the crown molding in place, then tap tap tap, and the nails (technically brads) were countersunk, securing the molding to the wall. So purchasing my own finishing nail gun had long been on my wish list. I finally bit the bullet and purchased one for my birthday to use on the bookcase project. I also got some angled finishing nails to go along with it. They arrived in the middle of these French cleat shelves. So the shelves were the perfect opportunity to hone my skills with the gun. 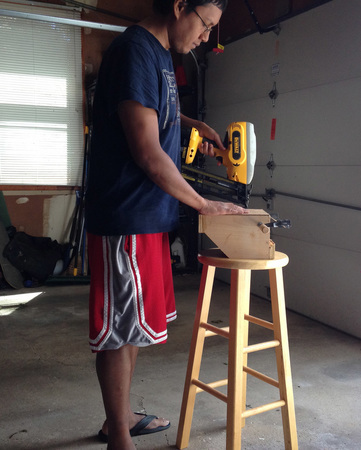 I originally purchased an 18-gauge finishing nail gun (keep reading to see why I returned it). For those not familiar with finishing nail gun terminology, the gauge represents the thickness of the nail. I’m using the word ‘nail’ loosely because these nail guns actually fire brads, which are strips of thick wire with a very fine head. They are great for finishing applications (like securing trim) because the heads make a very small hole and require little work to conceal. The thinness of the brads also reduce the likelihood of splitting the wood when they are driven in. Finishing nail guns are not to be confused with framing nail guns, which fire actual nails and use substantially more power to drive them (hence also more dangerous). 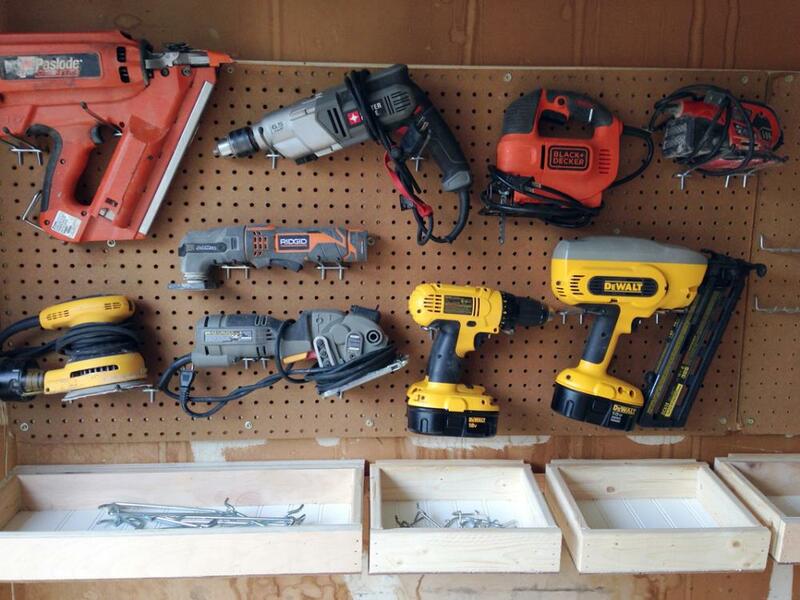 I used a gas powered framing nail gun in my shed project if you are interested. Anyway, I was saying earlier how I purchased an 18-gauge finishing nail gun. Unfortunately, I was not having a good experience using it with the birch plywood. Most of the nails would fire in straight, but then bend half way and stick out the side of the wood. It was very annoying. I did some research online and found out that 18-gauge nails don’t work well in hardwoods (like birch) and will do exactly what they were doing with me (changing direction as they are driven into the hardwood). So I decided to return the nail gun and get a 16-gauge version instead. The new nails were noticeablely thicker and worked perfectly for me. The gun is now a permanent addition to my top 12 list of must-have tools. What’s the best nail gun for a DIYer? Depending on the type of woodworking project you’re doing, sometimes you’ll need a thinner nail (higher gauge) and sometimes you’ll need a thicker nail (lower gauge). Unfortunately finishing nail guns can only fire a single gauge, so you’d need multiple guns to accommodate different nail gauges. This is obviously very expensive, and may not make financial sense for you unless you’re a dedicated contractor. So, 16-gauge is a good compromise because a majority of the projects a typical DIYer works on can be satisfied with that sized nail gauge. This has held true for me ever since purchasing the nail gun too. I’ve used it for everything from crown molding to shelves to quickly tacking on temporary supports for concreting wooden posts. It’s also my favorite tool, and well-worth the investment. With the finishing nail gun, construction of 5 box shelves went by very quickly. I only made 5 because I ran out of scrap wood large enough for box shelves. The remaining smaller scraps had another destiny. 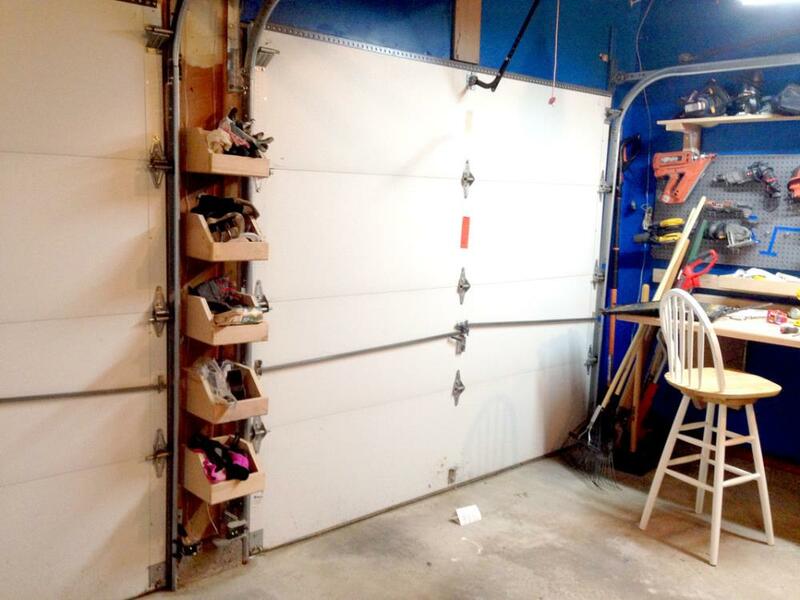 ​Five French cleat boxes were perfectly adequate for the space allocated though and would definitely create more garage storage and organization. 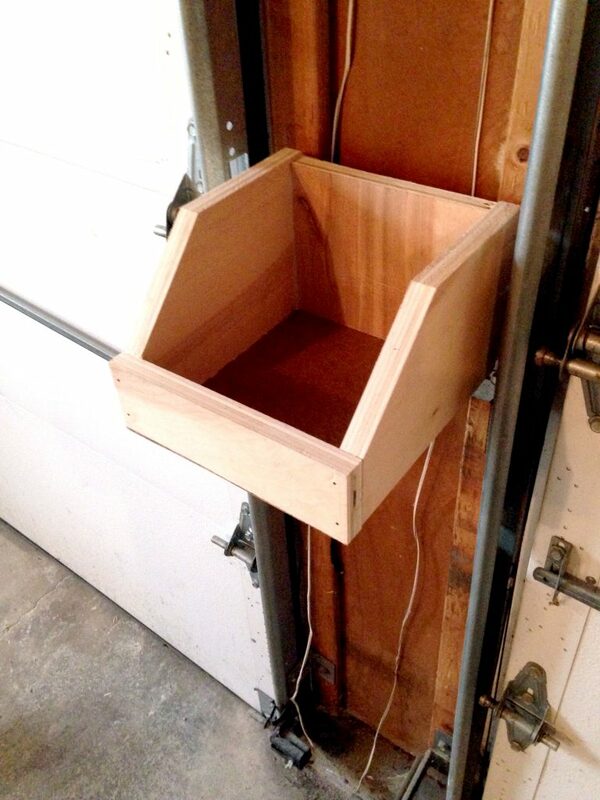 After this was completed, some of the remaining birch plywood scraps got used for another project. I was going finishing nail gun crazy and just wanted to keep tap-tap-tapping brads. So, I ended up making an incredibly useful battery charging station for my cordless tool batteries. 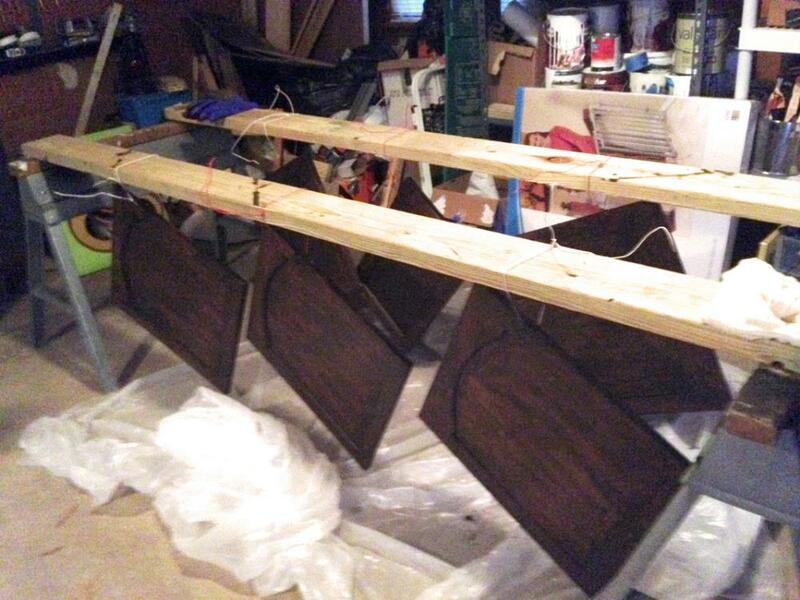 ​The garage storage station consisted of four L shaped shelves fixed to the wall, with two triangular supports each. Here’s what the shelves look like actually being used. This little nook helped get more garage storage and organization. The shelves created more garage storage – enough space for 4+ battery chargers, extra batteries and a host of accessories. I got creative and tacked on an empty plastic nail box to store stationary-like pencils, markers and scissors. I’m most proud of my measuring tape holder though. I was always looking for my measuring tape and needed a dedicated location for it, so I mounted a metal strip to one of the shelves, and the measuring tape just clips onto it. It’s in the perfect location too. Whenever I need a measuring tape, I just open the garage door and grab the tape off the holder. When done, I just snap it back on the holder and it’s there for future use. So that’s it for this round of more garage storage shelving. I constructed five French cleat boxes in the lost space between the double garage doors and added some bonus shelving too. Not only did I create more garage storage but this storage added another level of efficiency to our garage. I completed everything on a Saturday with no additional cost to me because I used all scrap wood. Although I benefited a great deal from the finishing nail gun I purchased around the same time, it could have been done with just regular finishing nails and a hammer. ​Stay tuned for future shelving ideas as inspiration strikes. I hope this article brought you some inspiration to get more garage storage too. For many years, I’ve been an avid amateur boxer, always looking to have a good sparring match in the ring with whomever is game. Lately though, it had been hard to make time for the gym, so I wanted to do a lot of my training at home, where it’s more convenient. I already had a cheap freestanding heavy bag (with the plastic base that you fill up with water – it was less than desirable but it gave me something to work with). I also have a double ended bag (attached to a ceiling rafter in the basement and to a water filled base on the floor) and a slip bag (maize ball) that I mess around with as well. Yet, what’s a good boxing workout without some rounds on the speed bag? 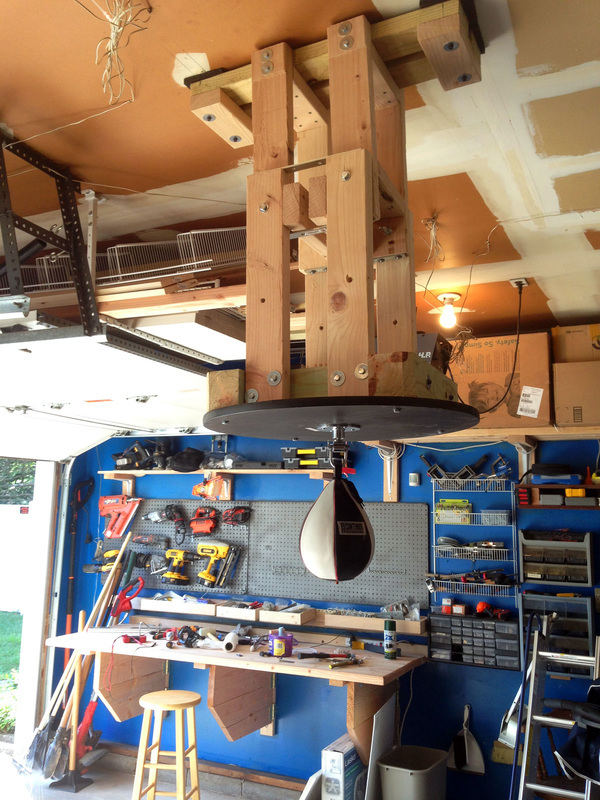 I had purchased a cheap speed bag platform many years ago and had it mounted in my previous home. However, it never got much usage because it was secured to some wall studs that would literally shake things out of my kitchen cupboards on the other side of the wall. Also, the house was very small and the noise carried everywhere. After moving into our larger home, the question of where and how to mount my speed bag lingered in the back of my mind for a long time. I really wanted it in the basement with my other boxing equipment, but the ceiling was really low. It would be awkward to hit the speed bag at that height. Also, remembering back to cereal boxes falling out of the cupboards at my previous home, I was worried about the vibrations travelling up through the ceiling rafters and having repercussions upstairs. I eventually decided on the garage as the ideal location. The ceiling was very high, so I could set the speed bag to whatever height I wanted. There was no second floor above the garage so no foreseeable issues with vibrations affecting things upstairs. Also, the garage insulated sound pretty well. So as how many of my projects start, I did a lot of staring (at the garage ceiling for inspiration). Finally it came to me. I would mount some type of contraption close to the center of the garage. Even with both cars pulled into the garage, there was a center aisle that was open that would be perfect for speed bag workouts. With the location selected, I had to be conscious of the clearance required for the speed bag platform. The garage was a busy area for me as it was also my workshop. 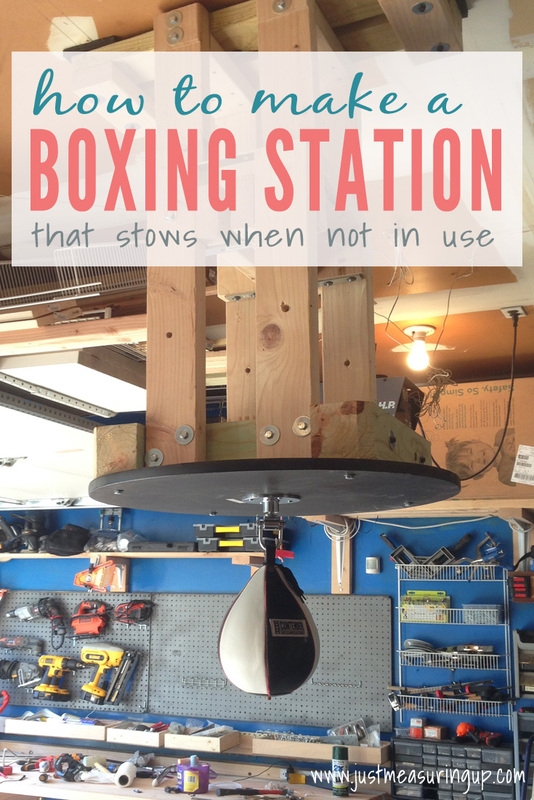 I did not want to have to keep dodging the speed bag every time I worked on a project in there. So I thought hard about how I could make a system where the speed bag platform could easily stow away when not in use and be lowered when it was time for a work out. I managed to build it entirely out of scrap wood. It consists of an upper and lower piece. The top part is a fixed mount attached to the ceiling. The bottom part slides into the top part and allows the speed bag platform to raise or lower. I used 4 heavy duty bolts, some washers, and some wingnuts to lock the platform into place when in the desired position. Additionally, I opted for the wingnuts to make them easy to remove. This was rather than using regular nuts and having to use tools to raise/lower. I also intentionally went a little heavy on the lower piece using some 4 x 4 wood. I wanted to make a solid rebound surface for the speed bag. I started working on the lower piece first. 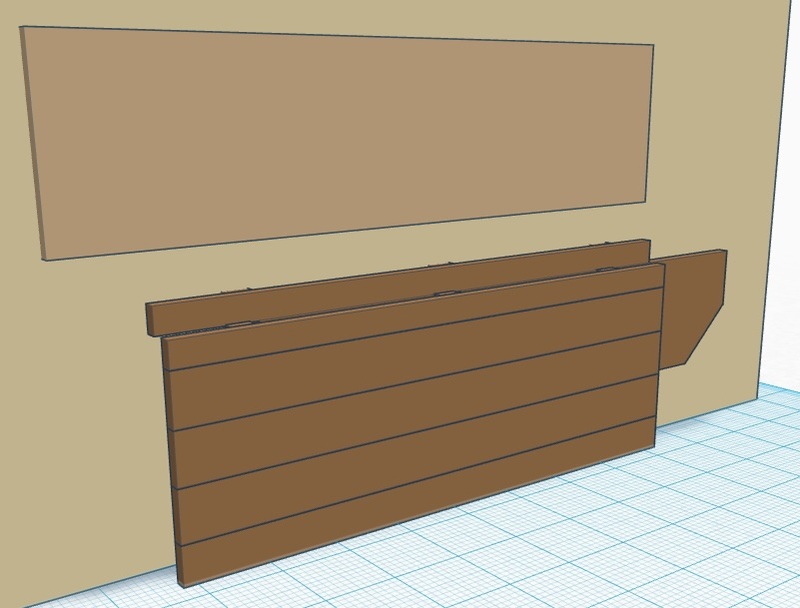 I cut the 2 x 4s and 4 x 4s to length according to the TinkerCad diagram and connected them together using construction adhesive, 3” deck screws, 3.5” lag bolts and even some 6” TimberLok screws. I built the red part first using 2 pieces of 2 x 4s and 2 pieces of 4 x 4s. This was followed by the green part (6 pieces of 2x4s). I connected the green part to the red part using eight 3.5” lag bolts and washers. Then the blue part (2 pieces of 4 x 4s) was connected to the red/green part using four 6” TimberLok screws. The upper part of the contraption is a little simpler. The two long 2 x 4s at the top will rest against the ceiling when mounted. The two dangling vertical pieces serve as guides to facilitate raising/lowering the platform. They will also have holes that align with holes on the bottom platform. This allows for bolts to lock the two pieces into place. 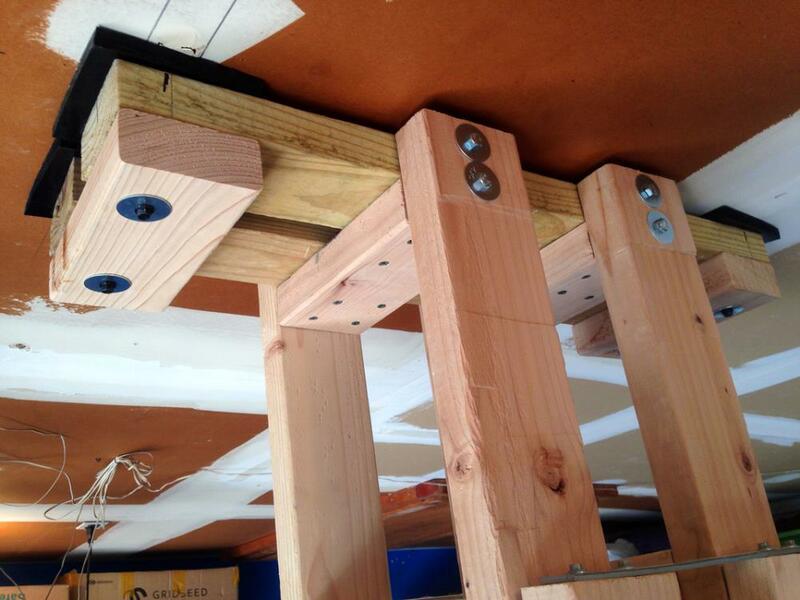 I used eight 3.5” lag bolts and washers to secure the vertical supports to the long ceiling 2 x 4s. The upper and lower pieces were now completed. To keep the two pieces in the raised and lowered position, I drilled matching holes (on the four vertical 2 x 4s) in both positions to allow four heavy duty bolts to pass through. To prevent the lower piece from falling out of the upper piece during a transition period (when all bolts have been removed and I’m raising or lowering the platform), I planned on screwing on two heavy gauge metal plates on the upper piece to catch the lower platform. So to mount the contraption, I had to secure the upper part to the ceiling rafters. In an effort to reduce damage to the drywall ceiling from vibration (and dampen noise as well), I used ½” thick neoprene rubber sheets in between the 2 x 4s and the ceiling. I purchased an 8 x 8 square of the rubber and cut it into four 4 x 4 smaller squares. I drilled a small hole in the middle of each square for the fastener to pass through and placed the sheets in between the ceiling and the 2 x 4s. For the actual fasteners, I opted to use four 6” TimberLok screws to connect everything to the ceiling rafters. With the upper part mounted very securely to the ceiling, it was now time to insert the lower part. I placed it into the raised position (highest it could go vertically) and temporarily held it in place with just two bolts. This was when I screwed on the two metal plates at the bottom to prevent the lower piece from falling out of the upper piece. 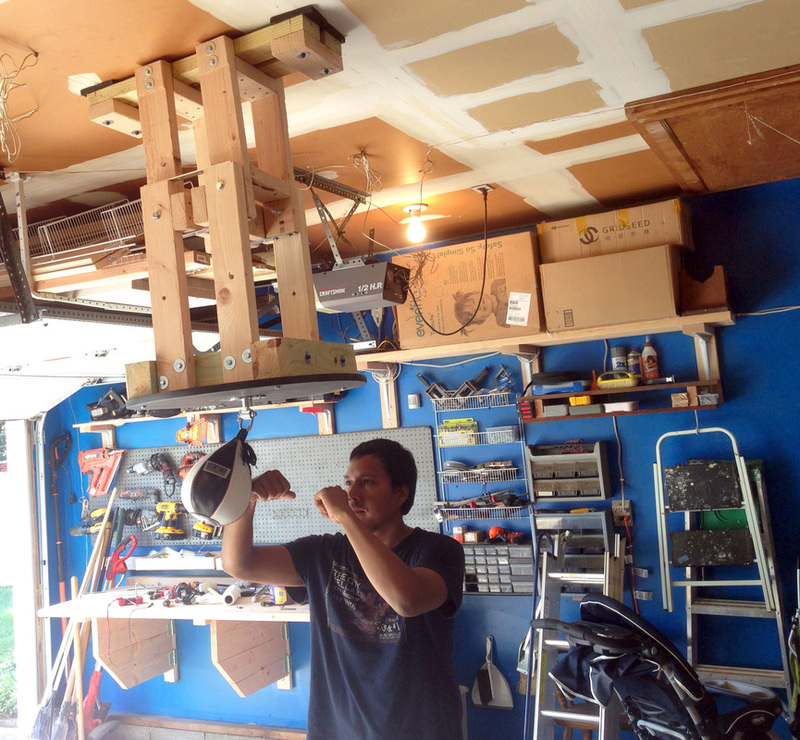 Now that my contraption was mounted securely to the ceiling, it was time to attach the actual speed bag platform. I just used some lag bolts to secure it. You’ll notice from the picture above that I had to notch the corners of the 4 x 4s. This was so they didn’t protrude beyond the edge of the circular speed bag platform. Also, the empty square space in the center of the mounting base was intentional. It allows the speed bag swivel bolts to pass through. It’s also an excellent storage pocket for the removable bolts. When the speed bag mount is stowed away in the raised position, I don’t need all four bolts in place. So, I just secure two of them and the remaining two get placed in this center square pocket. My garage speed bag project was completed, and I was very satisfied with the results. I did do some acoustic testing to verify the effectiveness of the neoprene rubber dampeners. I setup my phone to record audio from several key areas of the house and worked the bag as hard and loud as I could. When I played back the recordings, I could not hear the bag at all. So I was confident that I could now work out whenever I wanted to, and not disturb anyone. This project was completed over the weekend for under $40. I kept the cost really low by using all scrap wood. My only expenses were the rubber dampeners and some of the fasteners. I already had a speed bag platform and bag, so those cut down costs too. My platform is really cheap though (I believe I got it at Sears many years ago for $30). I would like to replace it at some point with a solid piece of wood. If you get a similar platform, at least get a decent bag (FYI smaller bag=faster rebounds, larger bag=slower rebounds) and a good swivel hook (not the plastic ball-bearing hook that a lot of cheap platforms come with). Also, I use sandbags (via a heavy duty training weight bag) on top of the platform to add more solidity to the bag rebounds. It reduces a lot of vibrations as well. Eileen always throws awesome parties, thinking of every little detail, from the decorations to the games to the desserts. Yet, once in a while, she enlists a little from from me. She was looking to create a do-it-your-self photo booth for a small backyard party. She had a backdrop and props planned and was looking for me to help her find a software program that would run on her laptop. To my dismay, I could not find any simple to use programs out there. Most of them you had to pay for, and the free ones were terrible. What seemed like a simple task was turning out to be quite problematic. 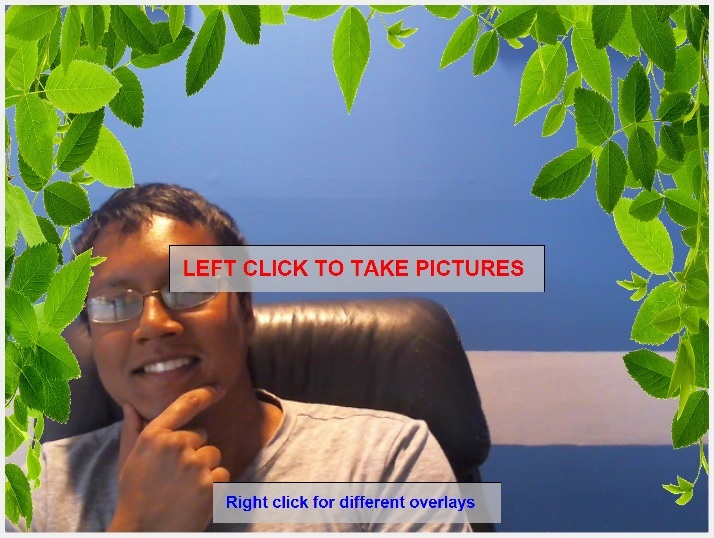 So, I decided to just write my own photo booth software. 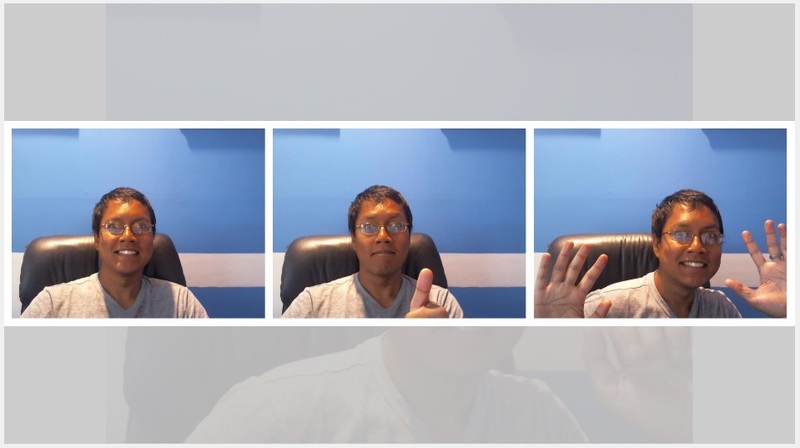 By the end of the day, I churned out an app I dubbed Easy Photo Booth. Eileen was totally impressed, and we’ve been using the app at parties ever since. My version was as simple and straightforward as they come. In front of the backdrop and props that Eileen set up, I placed a laptop (with a web camera) on a small table. The guests would then see themselves on the laptop screen. Easy instructions on how to proceed popped up. I even setup the software to save the film strip images to DropBox. This allowed me to run a slideshow on the large family room TV of a live photo stream from the photo booth (via a second laptop I had plugged into the TV). This way, other guests not taking pictures got to partake in the photo booth fun. My photo booth software was a huge hit. It’s now a staple event at our parties, and even our friends/families have started using it for some of their events. So I wanted to make the software easily available for everyone for free. 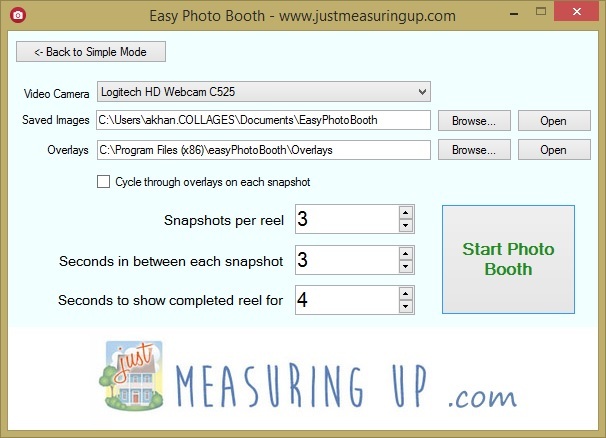 You can download a PC version of “easy photo booth” software below. I’m sorry, I don’t have a MacOS version of it, but I can port it over to Mac if I get a lot of requests for it. 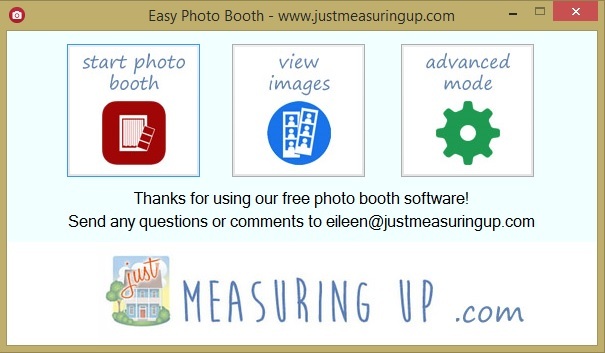 I made the photo booth app as simple and user-friendly as possible. And it has been working out perfectly! To get an idea, here’s a screenshot of the program in action. There are simple options – such as Start Photo Booth, View Images, or Advanced mode, which provides more advanced options for the DIY photo booth app. Film strip images like the picture above are generated from the software. It also saves the images individually in case you wanted to use a snapshot outside of the film strip. Digging through my scrap wood collection, I came across some pieces of pegboard from our previous home that I had forgotten about. I had just relocated a lot of garden tools to the shed, and there was an empty wall in the garage that would now be perfect for the pegboard. 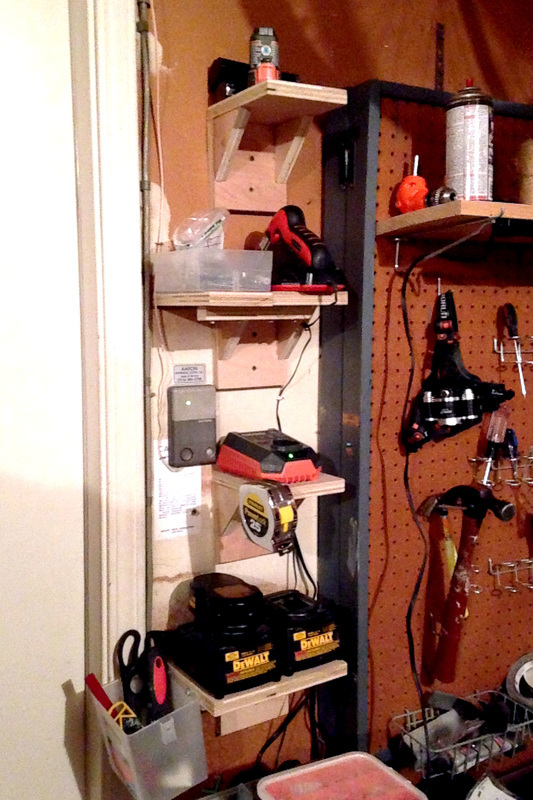 After mounting the pegboard and hanging up some tools, the wall still looked a little empty. 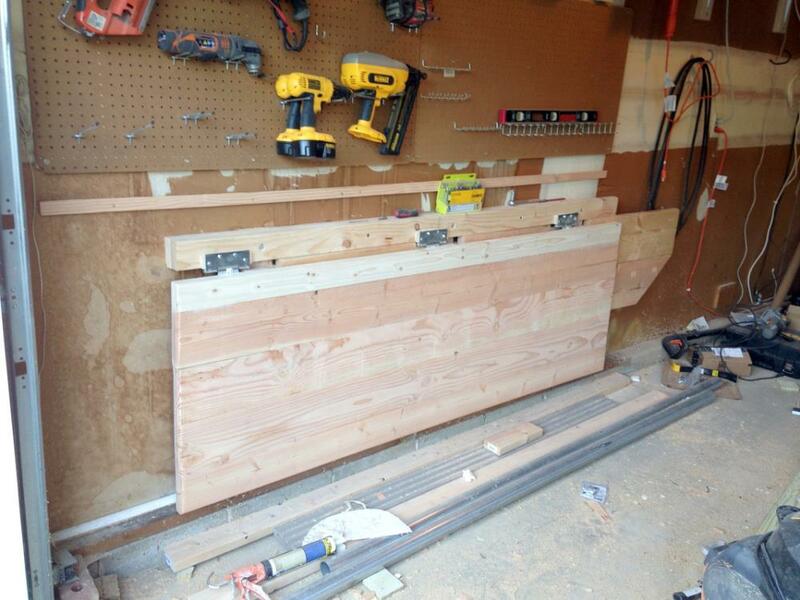 I had a vision of mounting a heavy duty folding workbench to the wall. This was the perfect location, and if the workbench folded, we could still fit the car in the garage. Moreover, I was also in desperate need of a good workbench. I had been using the driveway and garage floor for all my projects. 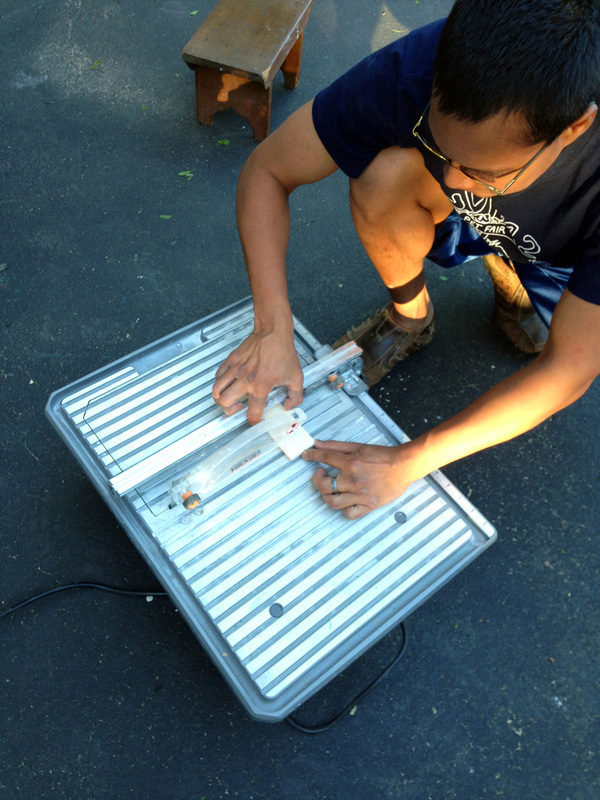 ​The lack of a completely flat and level surface made projects more difficult. 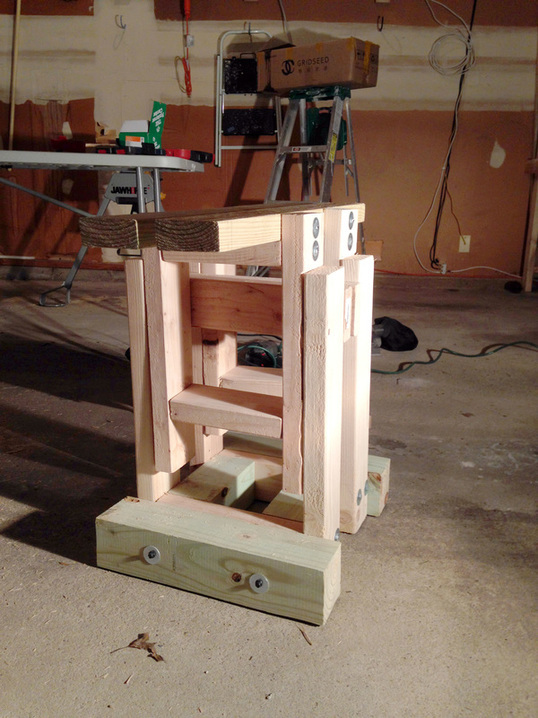 So I embarked on this bucket list project of building my own folding workbench. First off, the pegboard needed to be installed. I had to create a slight gap between the wall and the board to allow the hooks to be inserted. I used some scrap 1 x 3 wood left over from a prior project to create the gap. ​Using my table saw, I cut the wood in half lengthwise to make 1 x 1.5 strips and screwed them to the studs behind the drywall. 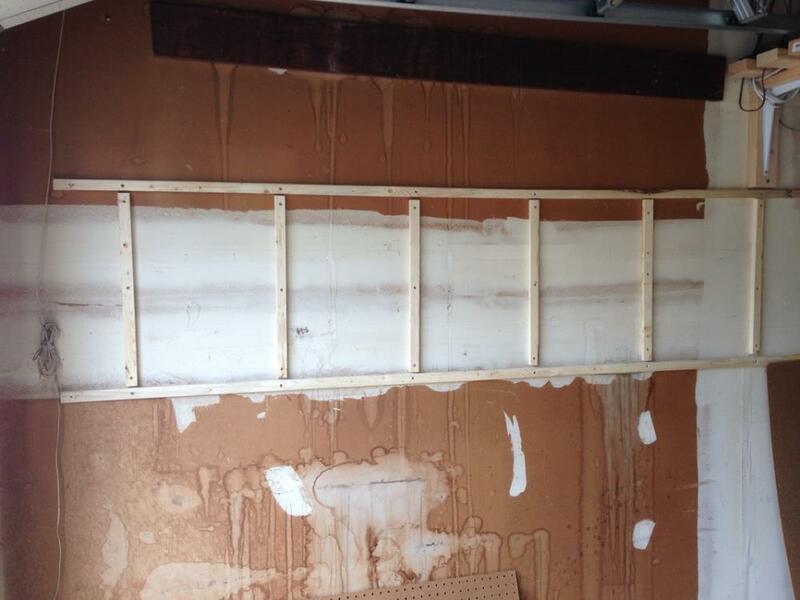 Then I hoisted up each 2 x 8 pegboard sheet and screwed them into the wood strips, using washers to secure the board. It all just seemed too simple, and I needed more of a challenge. 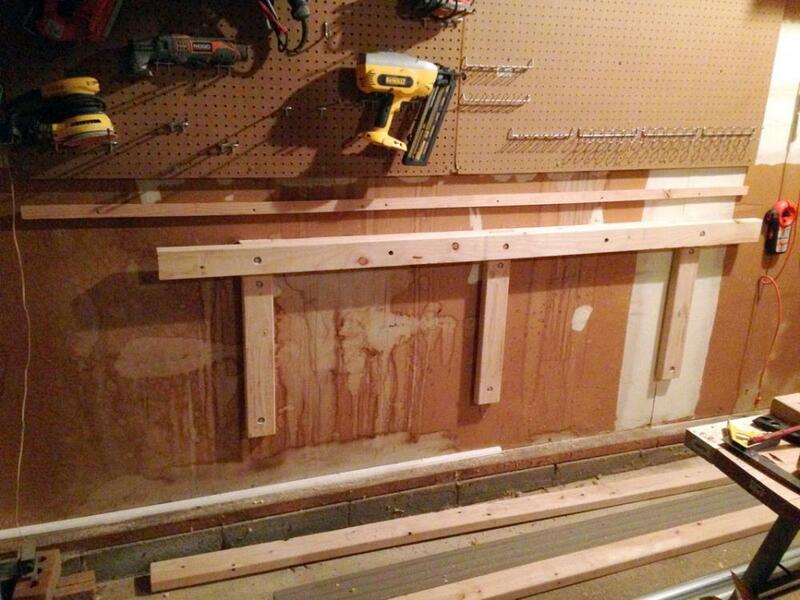 After, I hoisted up each 2 x 8 pegboard sheet and screwed them into the wood strips, using washers to secure the board. It all just seemed too simple, and I needed more of a challenge. 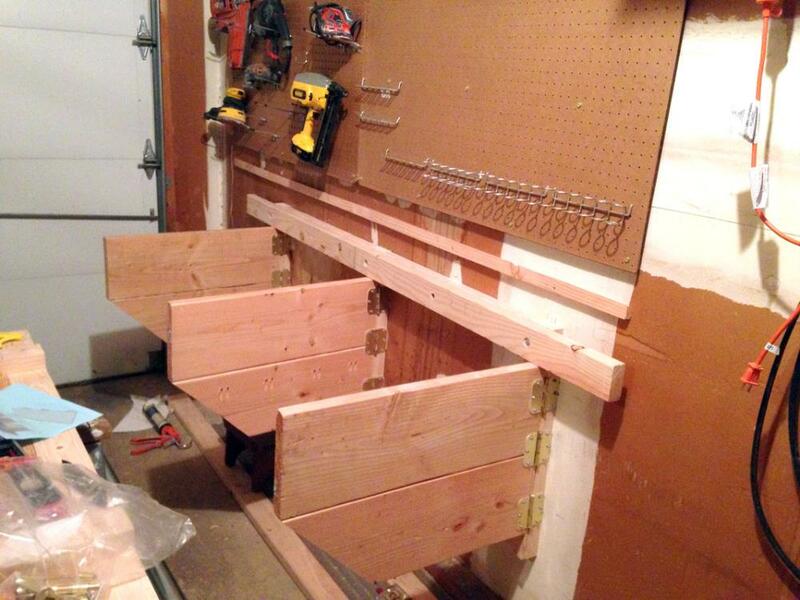 I then remembered some French cleat shelves I recently built in between the two garage doors (post to come soon!). They were portable shelves that could be removed from the wall by simply lifting. At the same time, they were very sturdily mounted. 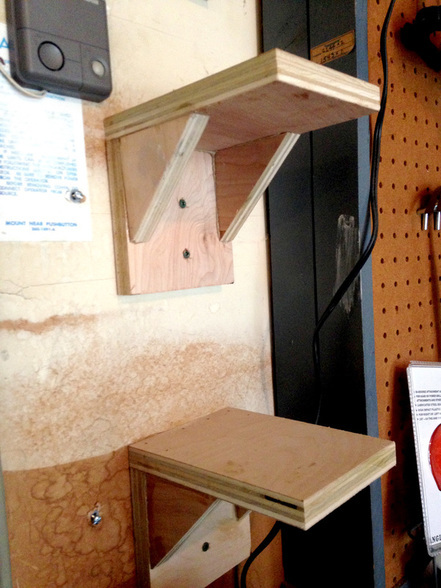 ​So I quickly made 4 shallow box shelves and rigged up a French cleat system for them. With the pegboard and shelves installed, I could start on the DIY folding workbench. To come up with the design, I first did a lot of research on existing workbenches, especially folding ones. I was initially considering one that folded up to cover the pegboard when not in use. A nice feature of that design was that it left below the pegboard intact. So, I could make use of the space for shelving in the future. I ended up ditching that idea because it would hinder my ability to get tools off the pegboard when the table was folded up. The extra space below the pegboard was not worth that inconvenience. Thus, I decided my workbench would fold downwards. Many fold-down tables I came across had built in legs at the front that swung down. I wanted to make my table free of legs to give a more roomy feel, and also allow easy access to the floor when the table was down. Sweeping up a sawdust covered floor is a lot easier with no table legs in the way. 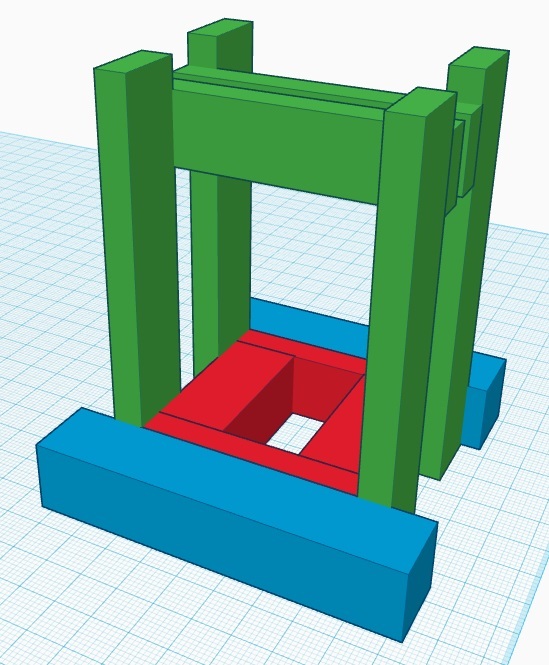 So finally, all my research culminated into a custom design, which I created in TinkerCad. As you can see in the diagrams of the DIY folding workbench, I planned to have the table supported with 3 wall mounted legs. Each leg would rest on hinges, allowing them to swing inwards and lay flat against the wall. With the legs folded in, the tabletop (also resting on hinges) would fold downwards to lay on top of the legs. 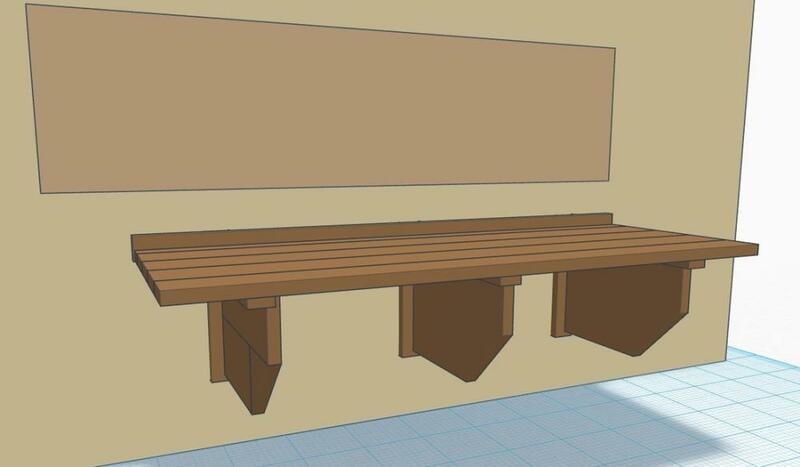 I really liked this floating workbench design and was eager to start work on it. The workbench construction consisted of 3 main parts – tabletop, legs, and wall mounts. Once completed, I would need to secure the pieces to each other with hinges. So first I started with the tabletop. 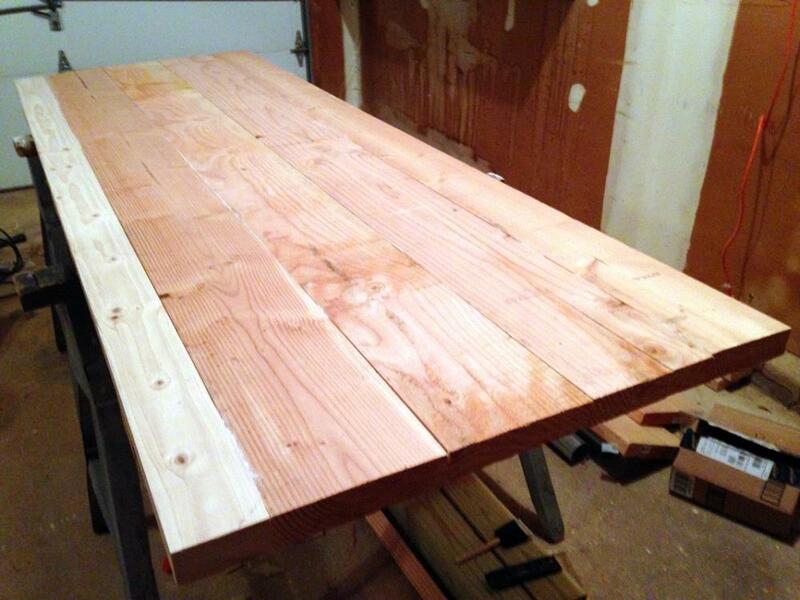 For the DIY floating workbench tabletop, I opted to use several planks of 2 x 8 and 2 x 4 wood for the top, much like a picnic table. I liked the look because it blended in well with my existing garage shelves (including a sliding shelf behemoth I made a few months ago). To assemble them together, I used a number of techniques. First I drilled 10 pocket holes along the length of each board. I used the Kreg Pocket Hole jig to precisely drill all the holes. 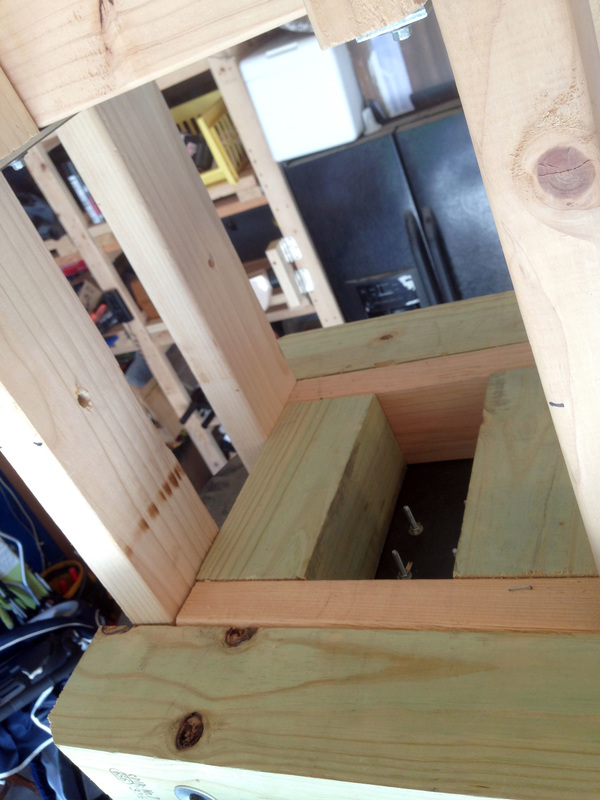 Then I applied construction adhesive to sides of the planks, clamped them together tightly and fastened them to each other with 2.5″ pocket hole screws. If you’re really getting into some wood working projects lately and don’t already have a variety of wood clamps, I would strongly recommend getting some. For years, I never had the need for any. Then about a year ago, I had to borrow a neighbor’s 3ft bar clamp to help hold some warped wood in place while I drilled it down. I was hooked ever since. 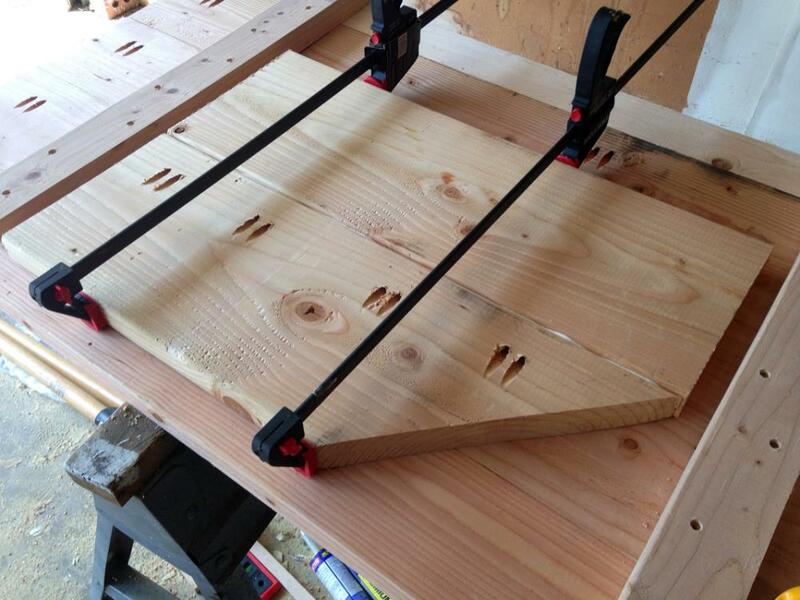 Now I’ve accumulated a host of clamps ranging from 3″ C clamps to 3ft bar clamps. For the bar clamps, I always try to get them in pairs because many clamping scenarios are better with multiple pressure points. A lot of bar clamps also convert to spreaders, which let you “spread” a certain distance between two pieces of wood (never thought I’d use that feature, but trust me, you’ll run into a scenario where you’ll want to pry apart two pieces of wood). I’ve also got a few 90 degree clamps, which are a godsend for building bookshelves (or any other scenario where you need to secure two pieces of wood perpendicular to each other). I even use an awesome Kreg face clamp to keep two pieces of wood perfectly flush for joining (also use it for the pocket hole jig to keep it in place as well). 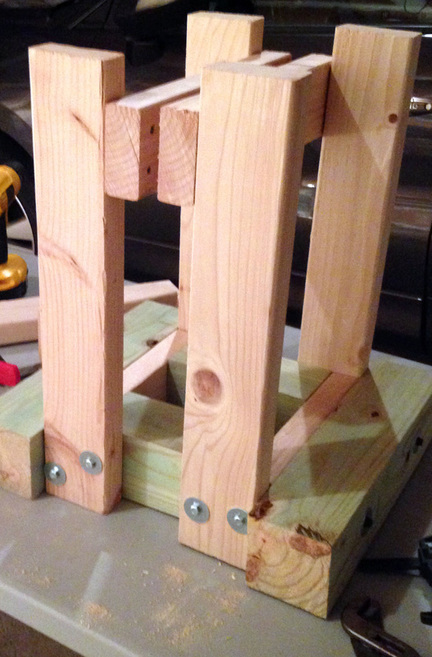 Alright, enough rambling about wood clamps. Finally, I ran 3 perpendicular 2 x 4 supports underneath the tabletop for additional strength. These supports also serve as stops for the swinging legs, so the spacing of them was actually determined by the positions of the legs on the wall. 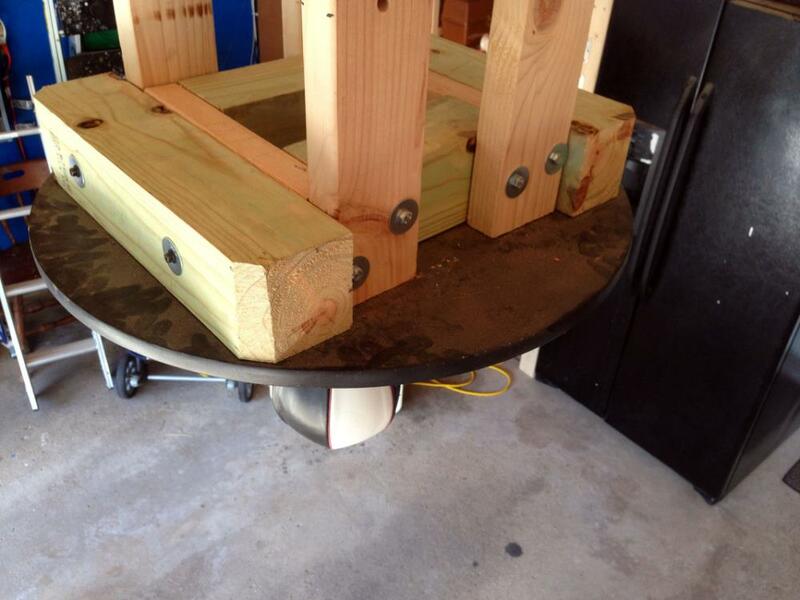 The floating workbench’s tabletop was very heavy but sturdy. The surface and edges were a little rough, so I planned to sand it down in the end and then route the edges with a rounding over bit. Each leg consisted of 2 pieces of 2 x 10 planks, cut to 27” in length. I secured the planks to each other, similar to the table top (with pocket holes and wood glue). I did notch the corner of each leg structure with a 45 degree cut for a nice angled design. This would give me more leg room, and also eliminate a pointed edge to get snagged on. 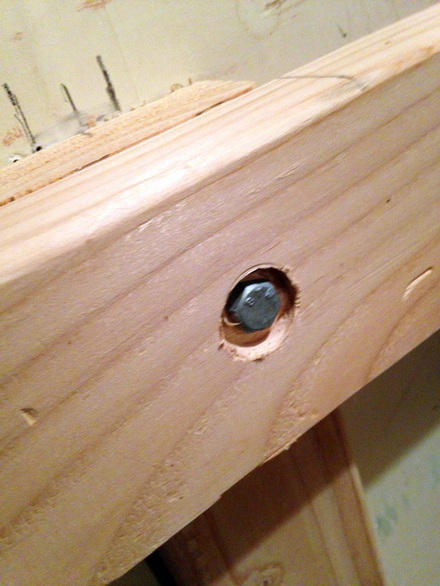 The next task was to bolt 2 x 4 mounts into the wall studs. I used 3.5” lag bolts for the fasteners, and made sure they were perfectly level. 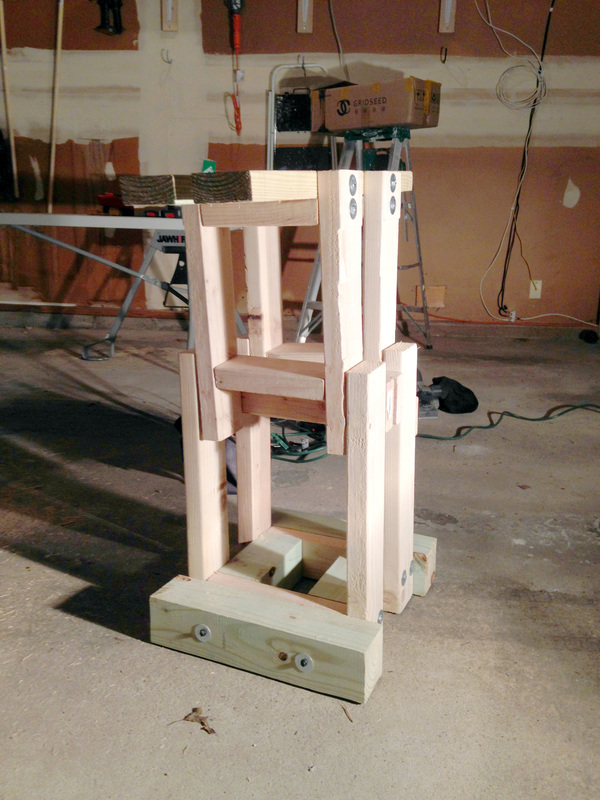 For the horizontal 2×4 (that the table top will hinge to) that connects to each vertical support, I used 5 fasteners to secure it. 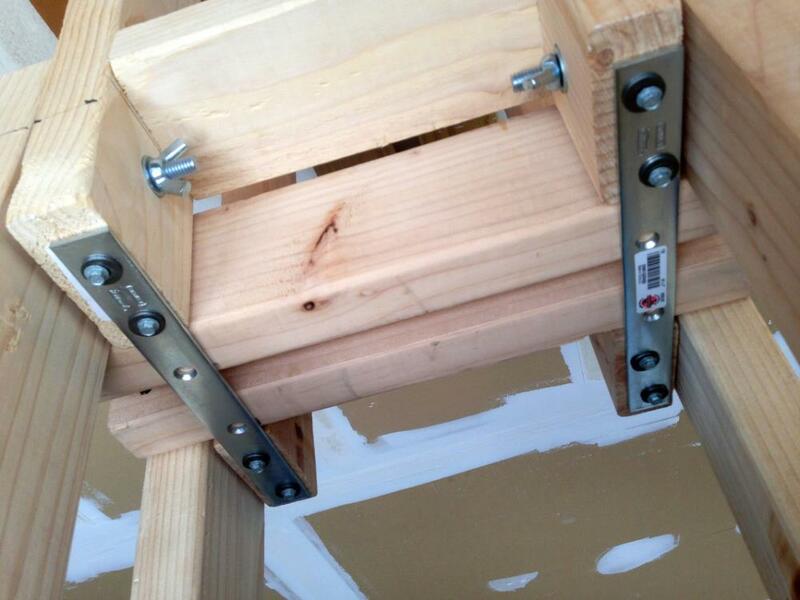 I used 3 lag bolts to attach to each vertical support and two 6″ TimberLok screws in between the vertical supports to attach it directly to two additional wall studs. 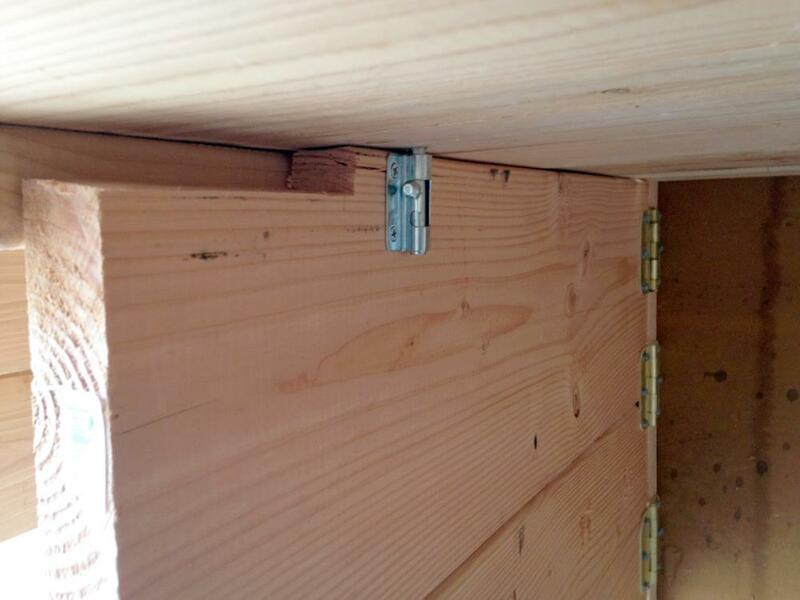 For the lag bolts, it was essential that they were flush with the surface of the wood. Up until recently, countersinking lag bolts was not a clean and easy task for me. This was until I bought a set of Forstner bits that made the task a breeze. Unlike regular drill bits, Forstner bits are specially made to cut flat bottom holes to precise depths. Finally, with the 3 main project segments completed (table top, legs, mounts), I could start attaching them to each other with hinges. Prior to a Home Depot trip for all the lumber, I stopped by the local Habitat for Humanity Restore. I was in luck because I picked up 12 used door hinges for a mere $3. Home Depot was selling a pack of brand new ones for $23. I highly recommend the Habitat stores if you happen to live near to one. 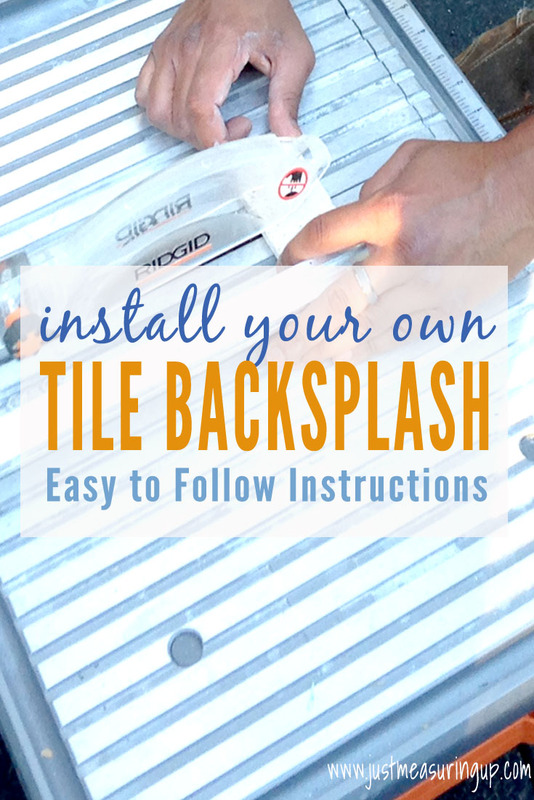 They can sometimes yield big savings for your DIY projects. 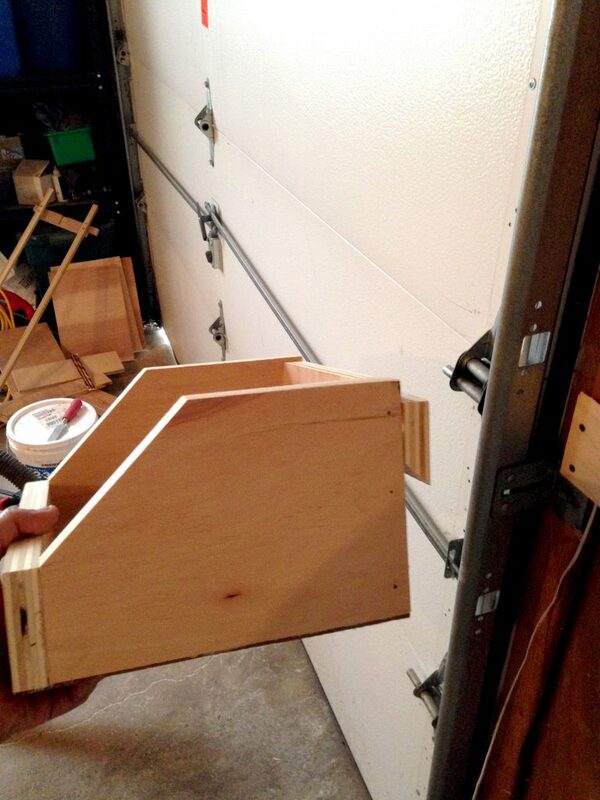 Attaching the hinges went on fairly easily. I used three of the regular door hinges for each leg. 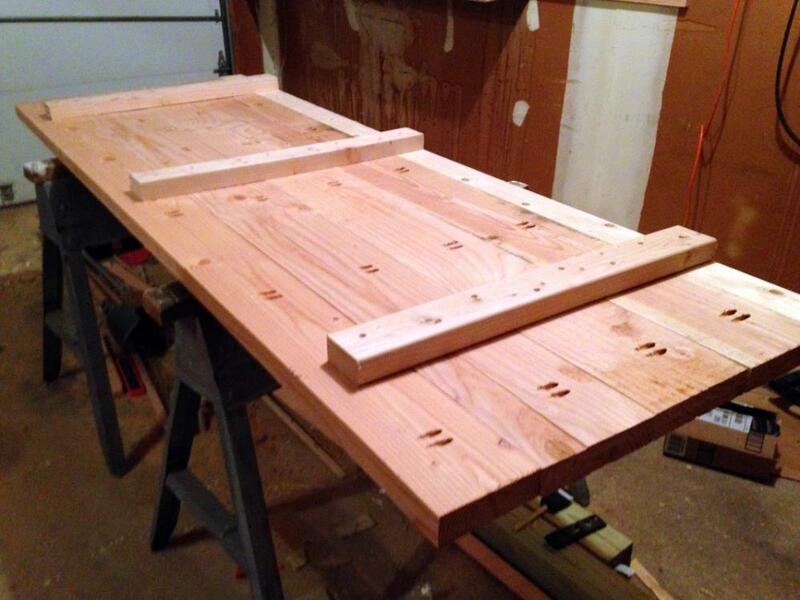 Then, I used 3 heavy duty hinges for the table top. I positioned the table in place, and attached it to the wall mounts with the 3 heavy duty hinges. I used two types of fasteners for the hinges. For the wall mount connection, I used four 1/4″ lag bolts per hinge. For the table top connection, I used Simpson 1.5″ structural screws (these screws are amazing for all sorts of projects due to their anchoring strength, so I always have some on hand in the garage). To prevent the doors from accidentally swinging shut while the table was down, I attached a small bolt lock on each leg to lock them into place. 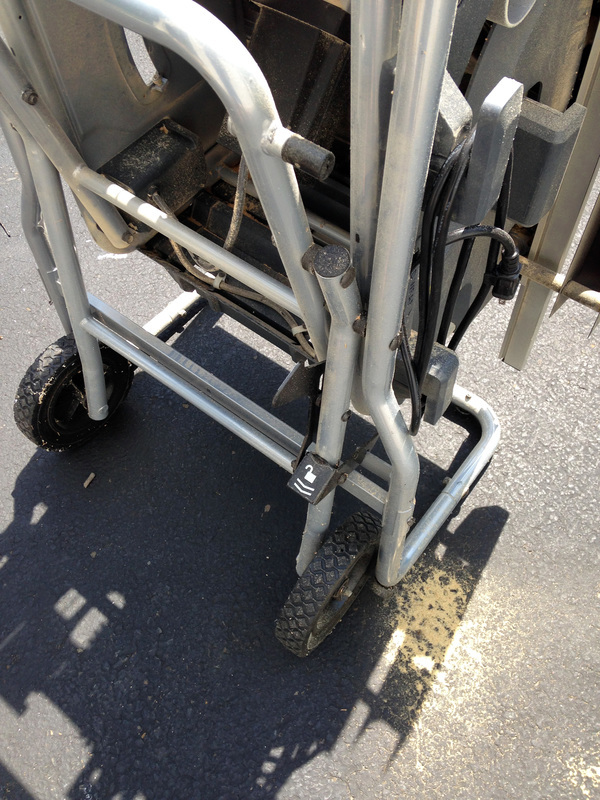 Here is the bolt lock in action to secure the swinging legs. The floating workbench was practically complete at this point. 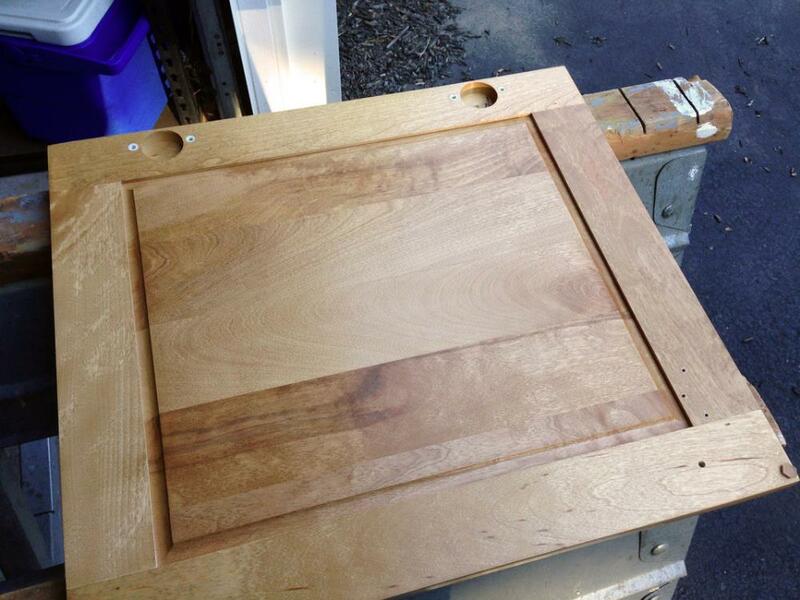 The tabletop just needed a good sanding, and the edges needed a nice routed cut. I used a 3/8″ radius round over edging bit with my plunge router. Finally, I finished the DIY wall-mounted, folding workbench. Confident in its strength, Eileen and I both sat on it to prove that it was a sturdy design. The table did not even budge. Eileen has plans to paint the garage walls. She found two gallons of high-quality blue paint at the Restore. And, she has an idea to make the pegboard look nicer too. Stay tuned for an updated picture! Lumber and materials costed around $150. I completed the entire project over the weekend. 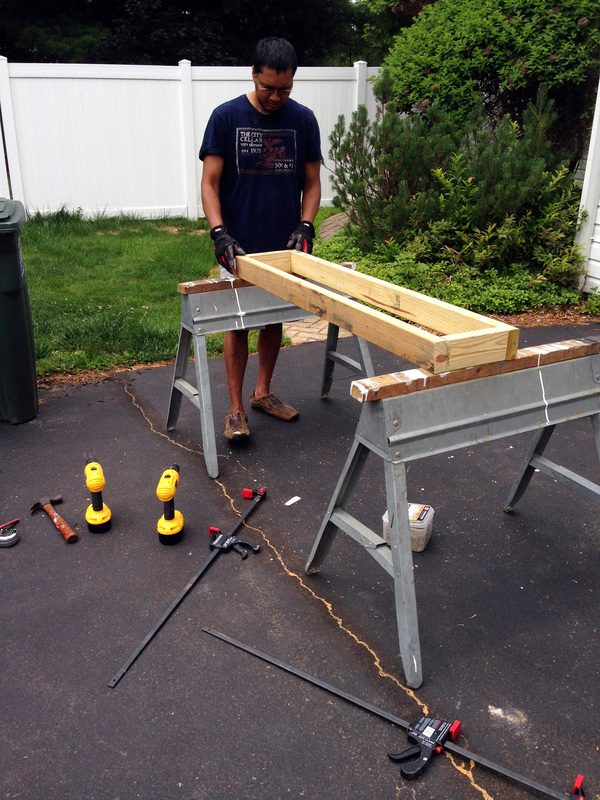 Overall, the DIY folding workbench was a much needed addition to my garage workshop. I will be using it a lot in the very near future. 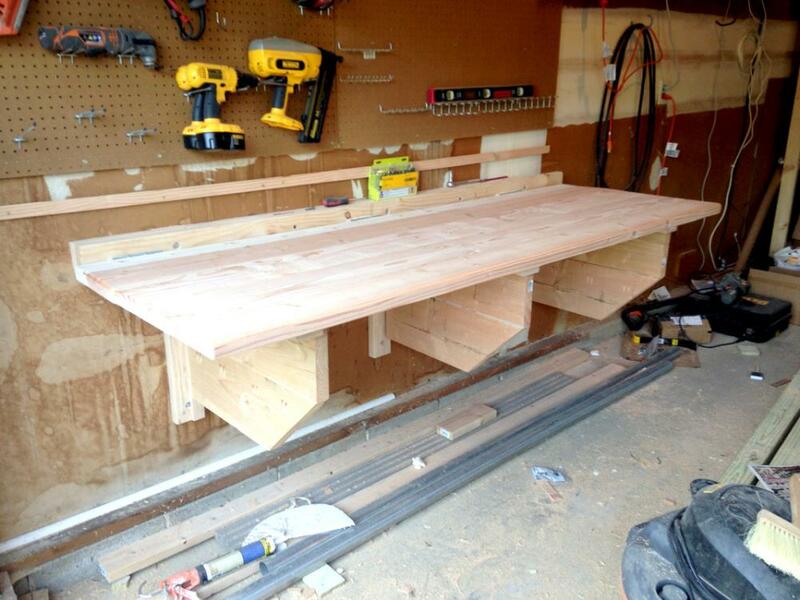 We are already enjoying how much space the floating workbench saves. We love that we didn’t compromise any of our garage space while also finally having a place to work. 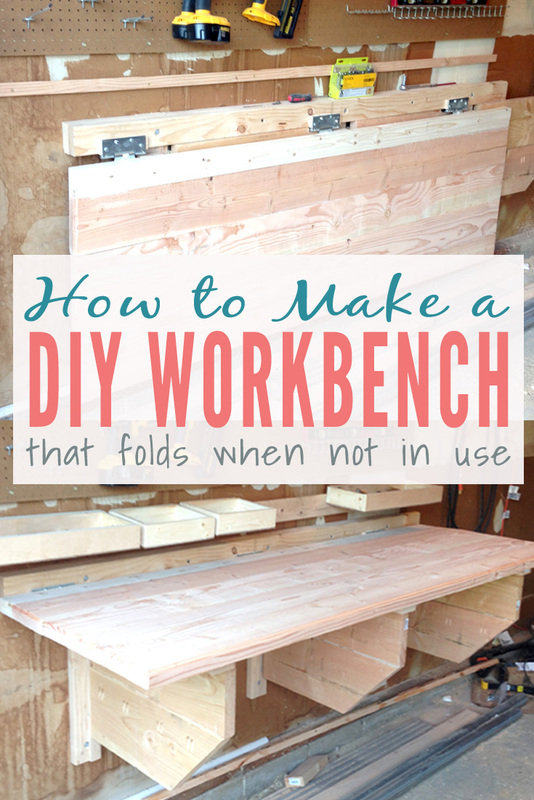 If you are in need of a workbench or are looking for a folding solution, this DIY folding workbench is completely do-able and you will love the results. In short, the KT1015 Kobalt table saw is an outstanding saw for its value and should perfectly suit the needs of any DIYer. 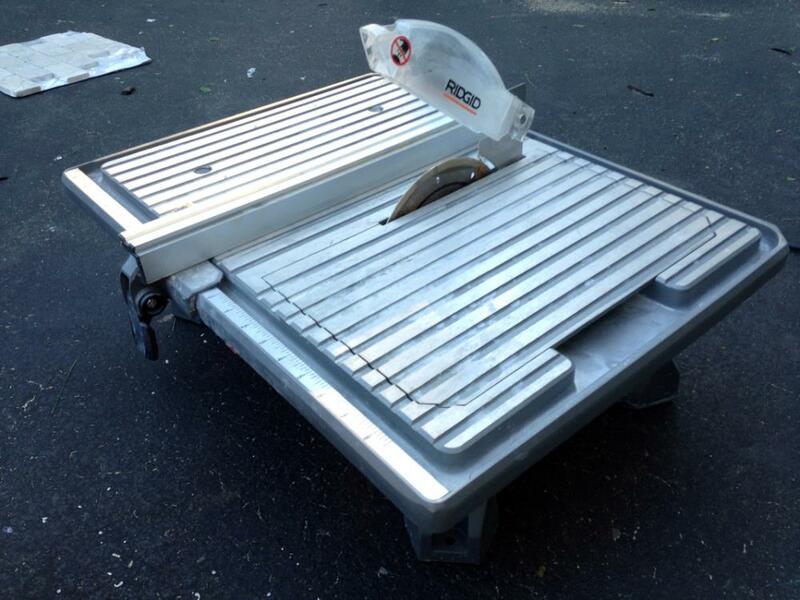 From ripping plywood sheets to cutting lap joints with stacked dado blades, this table saw does it all for a budget price. Earning 4 out of 5 measuring tapes, it’s definitely one of my most treasured tools. With the Kobalt in my collection, I am able to complete a whole new range of projects. For many years I got by without a table saw. I’d always just used my trusty handsaw or circular saw. Because our previous home was small, I just didn’t have a need for it. I couldn’t work on as many projects as I wanted to. This changed once we bought a larger home. 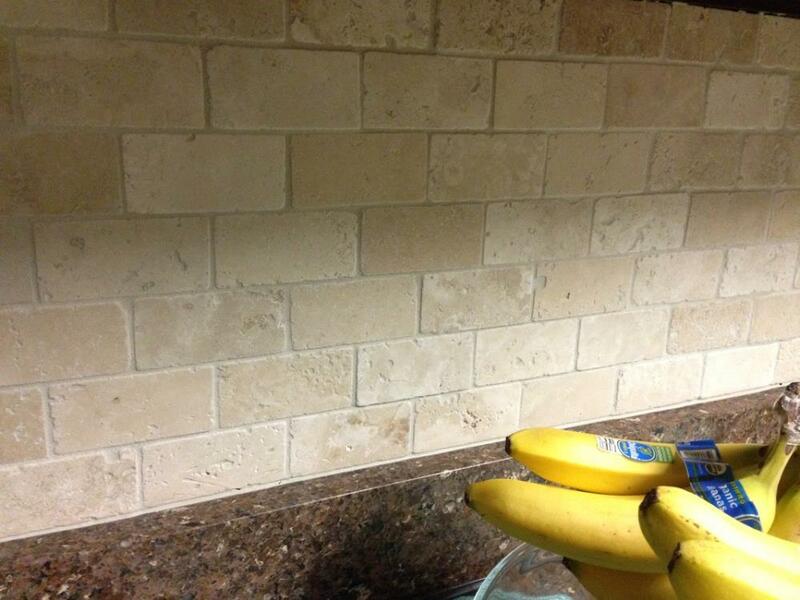 The list of projects we wanted to complete on our new home was endless. A larger yard meant things like planter boxes, storage sheds, and picnic tables. 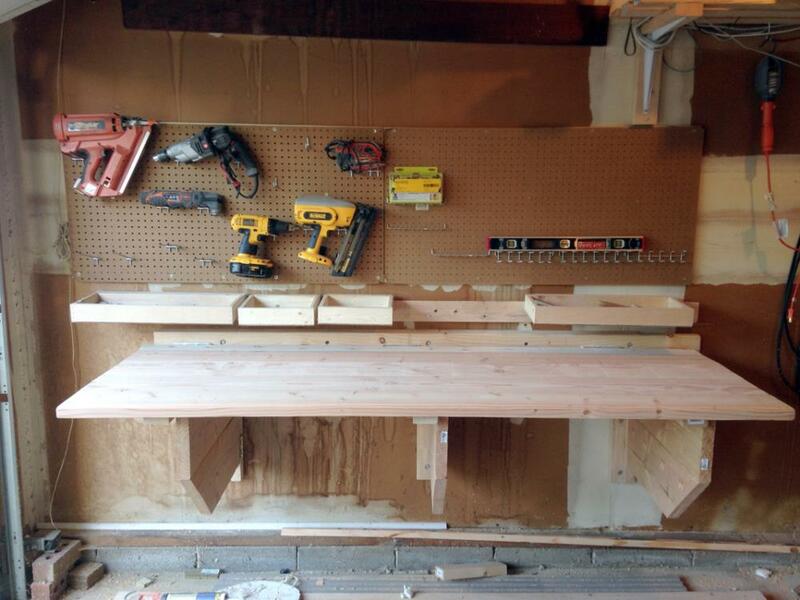 A more spacious garage meant custom shelving and work benches. The projects went on and on. It was inevitable that the need for a table saw would come up. It was the construction of the shed that prompted this. The first couple weeks of working on the shed, I used my handsaw and portable power saws. Then as I got deeper into the project, I ran into a wall. I realized that I needed to make certain long narrow cuts. These cuts were nearly impossible to do reliably and consistently with my current means. So it was time for a table saw. I was really excited as I had always wanted one, and this was the perfect opportunity to make the investment. I researched many types online so I could find the best table saw. At the time, the prices ranged from around $250 to thousands of dollars. There were two main deciding factors for choosing this saw versus others in the same price range. The first one was the maximum cutting depth at 90 degrees. 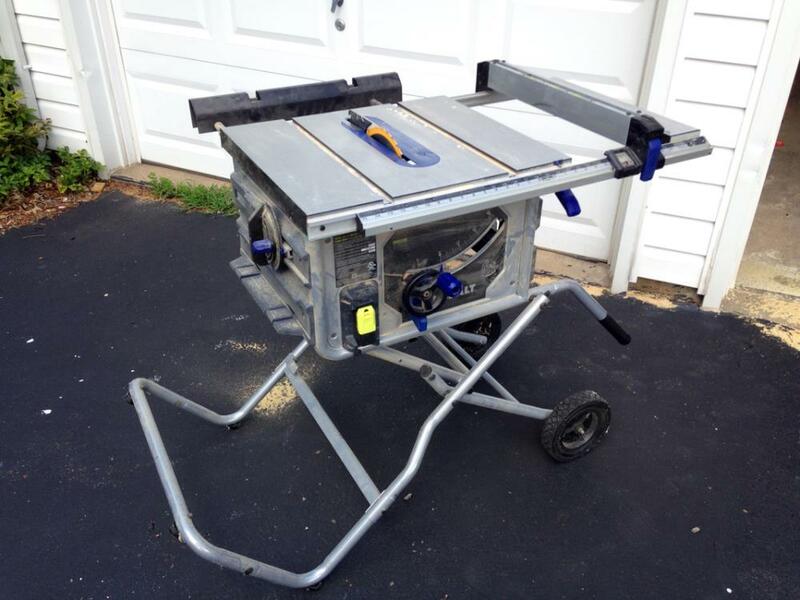 The second decision factor was that the Kobalt table saw came with a folding built in stand. I didn’t fully understand the mechanics of its intended operation until watching some YouTube videos. Then I decided this saw was perfect for me. 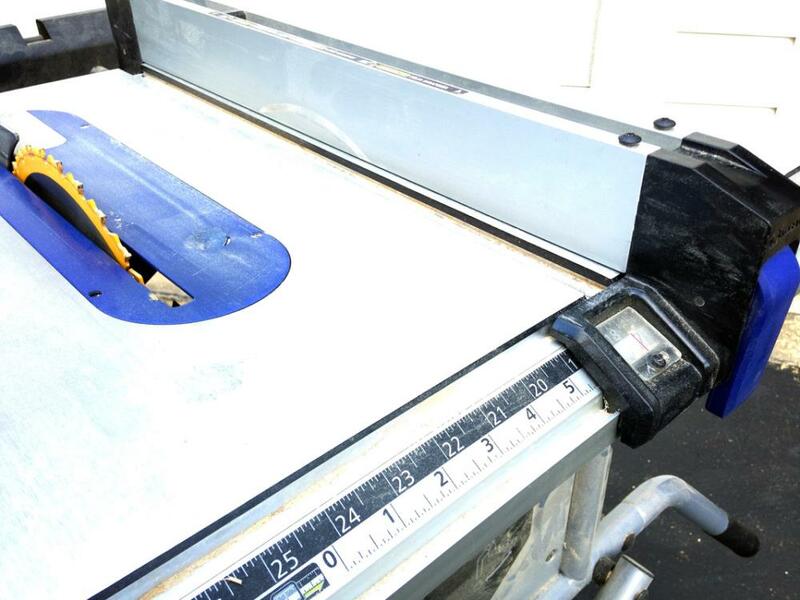 During normal usage, the saw sits on its stand and works like a regular table saw. Then when you’re done your cutting for the day, you press a foot lever, raise two handles and the saw tilts vertically on its side and is wheeled away for storage. In this mode, it looks and maneuvers like a two wheel dolly. Because it stands up vertically, it takes up minimal space against the wall when not in use. This was perfect for my setup as I did not want a permanent spot for the table saw and was hoping to easily pull it out as needed. In the picture below, the lever with the lock icon transforms the saw into working position. The table saw arrived about a week later at my front door. I was held up from working on the shed project due to cuts needed from the saw, so I was eager to set it up and continue construction. It took about an hour to assemble all of the parts and learn operation of all the features. Since it was my first time using a table saw, I did a number of practice cuts with scrap wood to get a feel for the saw and its mechanics. I verified the 3.5” max blade height with a piece of 4 x 4. Then, I tried some angled cuts with the included miter slide. I also ripped some bevel cuts on some 2 x 4s. The cuts were clean and effortless. The dust port sprayed most of the sawdust out and away from me, piling it up in a hill. Once I was comfortable with the Kobalt table saw, I did the real cuts I needed for my project and was very happy with the results. Here is a picture of the side showing the yellow power switch and the blade adjustment wheel. You can raise or lower the blade by spinning the wheel. Also, attached to the wheel is a bevel lever that you can use to adjust the angle of the blade. I found the power switch to be in the perfect location because it is easy to turn the saw off with your knee after a cut. The opposite side of the saw is where the sawdust shoots out. One thing I was not too happy about with the Kobalt table saw was the misalignment of the riving knife. The riving knife is a metal splitter that sits just behind the blade. As the saw blade cuts through the wood, the riving knife slides right into the freshly cut groove and forces the wood to remain parallel to the guide fence. It’s a safety feature of table saws that helps to prevent a lot of kickback (when the spinning motion of the blade forces the wood to jerk back at you). The riving knife is supposed to be aligned perfectly with the blade, but mine was not. It actually wasn’t too bad at the beginning, but as I used the saw over the next couple months, the alignment got worse. The Kobalt table saw manual did come with instructions on aligning it via some hexagonal screws, but I haven’t gotten around to fixing it. I did also read online about a number of people having trouble with the alignment and could not fix it regardless of the adjustment screw settings. Some people have even had to stick washers into the riving knife mounting points to align it manually. Hopefully when I get the time to look into it more, it will work out for me. In the meantime, when I cut wood, the riving knife either happens to nudge into the cut groove, or I have to place a pre-cut block of scrap wood to force the alignment. I do occasionally just use my finger to manually nudge the riving knife into place with the blade spinning, but this is highly dangerous and I would not recommend to anyone (note to self to stop doing this and fix the alignment). Another thing that I was not too fond of was aligning the guide fence. This is the guide that runs parallel to the blade that you slide your wood against to ensure your cut is even. 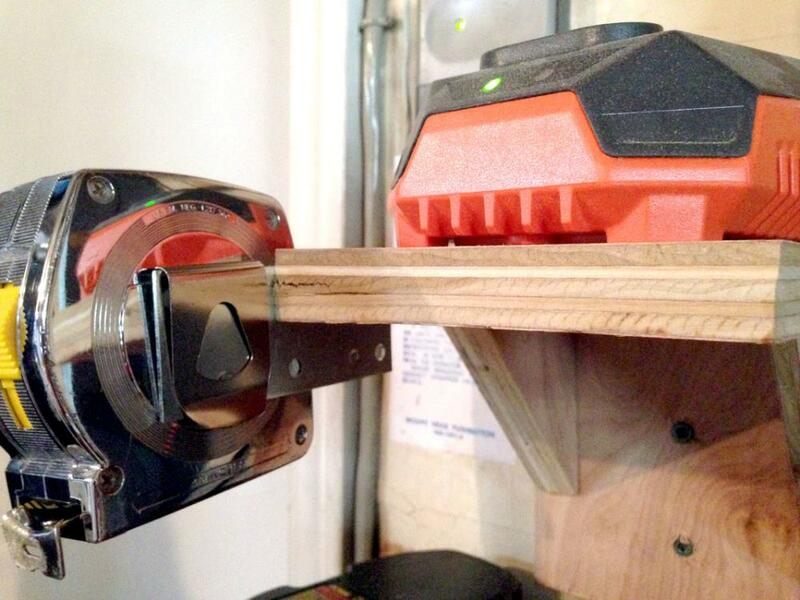 The guide has two clamping levers on both ends that you engage to lock it down to the table saw surface. The problem with this technique is that you have to manually ensure the guide is parallel to the blade. If the guide isn’t parallel (within a close margin of error), then your cut is not going to be straight. Also, your wood will likely get stuck at some point as you slide it through the blade. So both ends of the guide have to be the same distance away from the blade. It’s really not that difficult to do. However, it can get annoying if you’re making a number of cuts and constantly adjusting the fence. I’m used to using a tape measure to ensure both ends of the guide fence are the same distance from the edge of the table. Other people use a speed square to quickly align the fence. The fancier table saws use a rack and pinion system for the guide fence. This is where you spin a handle to slide the fence left or right. This would be perfect for me if I had a few more hundred dollars to spend on a table saw. Yet, that was outside my budget. Here is a picture showing the guide fence with one of the adjustment levers. There is a ruler on the front to help you set the distance from the blade, but I find this not to be always accurate. I tend to rely on my trusty measuring tape. So the misaligned riving knife and the work needed to setup the guide fence are my only squabbles with the KT1015 Kobalt table saw. 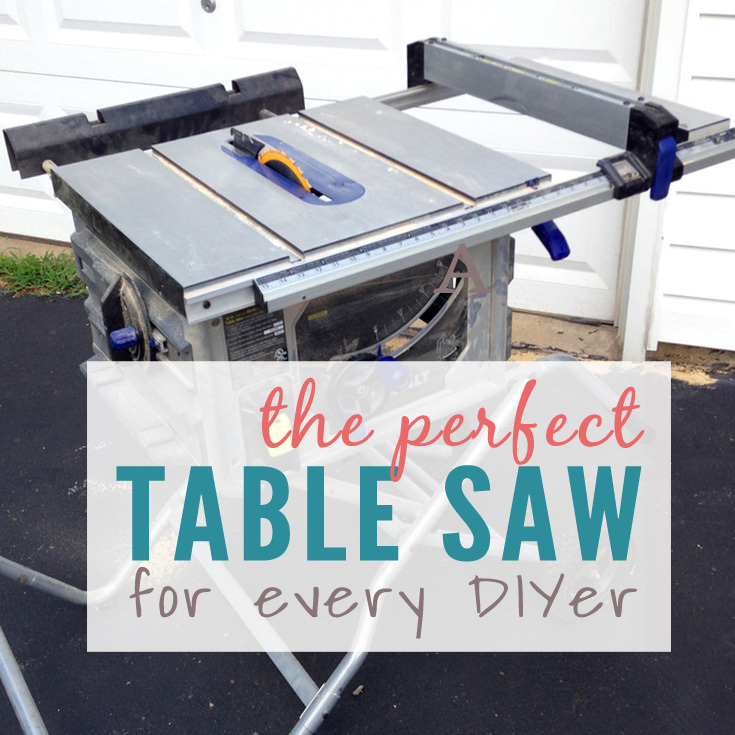 It’s a terrific saw for a great value and should satisfy the needs of your typical home DIYer. 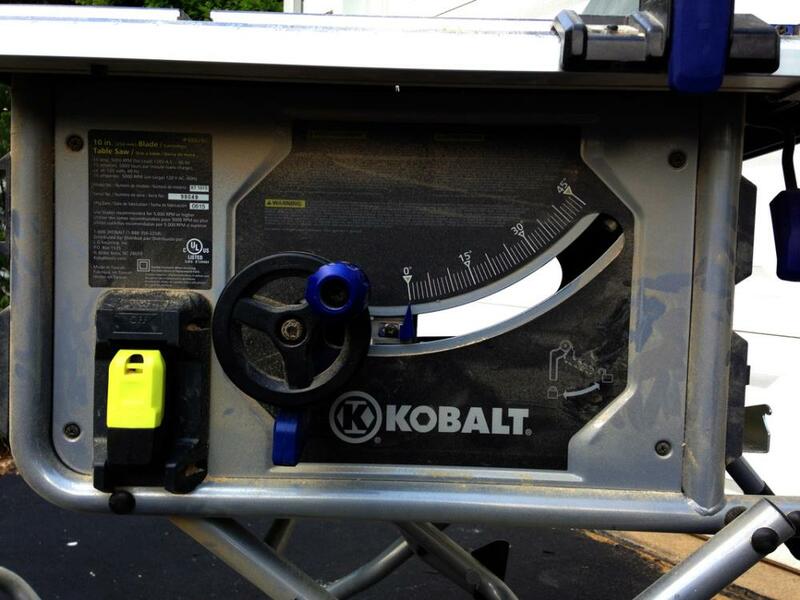 My most prized item in my tool collection is definitely this Kobalt table saw. For a mere $300, it has put me on a whole new level of craftsmanship, and allowed me to accomplish projects that would have been nearly impossible in the past. I ended up buying a featherboard. Some people make one but I found it easiest to just buy one. Featherboards are great when you need that extra bit of precision as your guiding your piece of wood into the blade, the featherboard will keep the beginning flush against the fence ensuring a more consistent cut. It was a pretty cheap purchase, and it’s a really nice accessory to have with the Kobalt table saw. 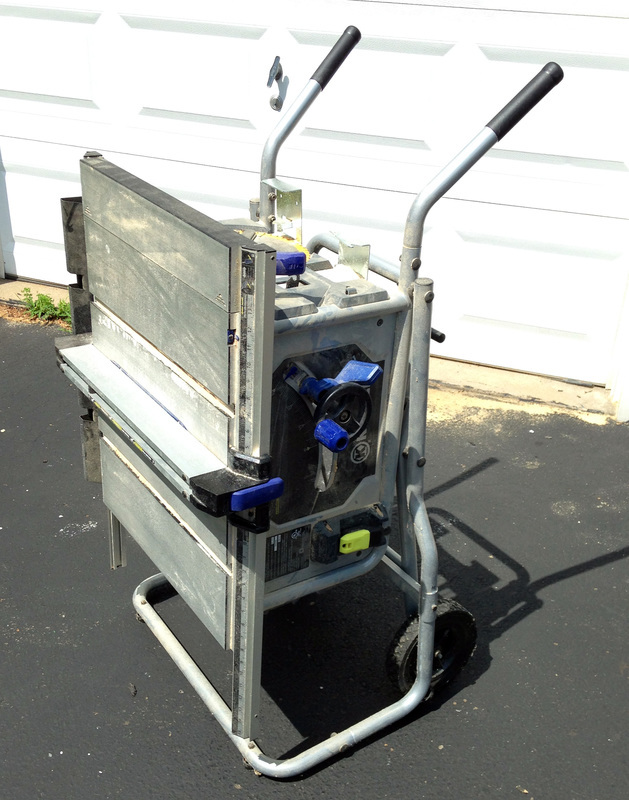 Listed below are the projects where I used the Kobalt KT105 table saw. To see detailed steps and pictures, click the project below. General Finishes Gel Stain is a DIY dream. 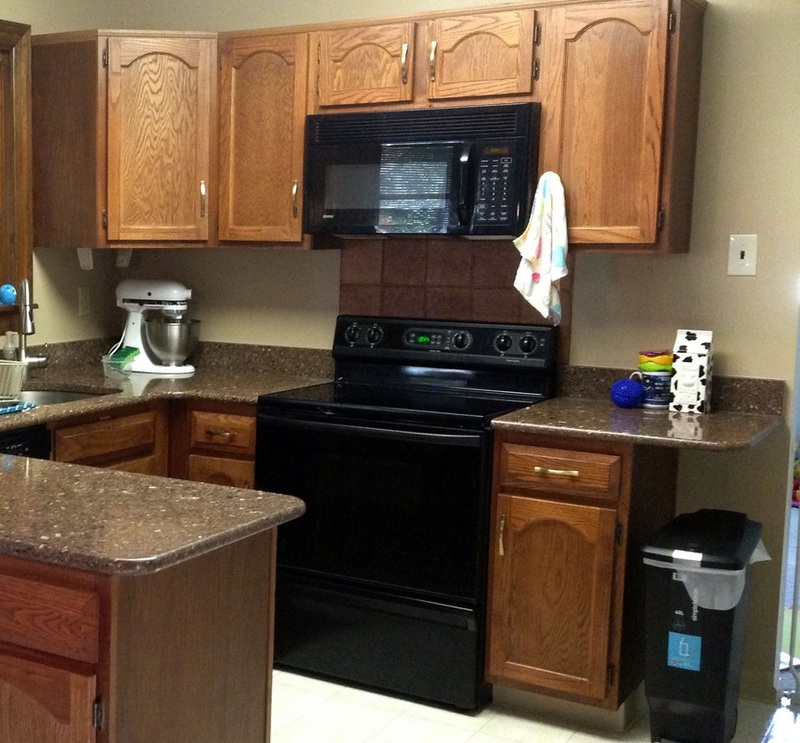 If you are up for the work, you can completely change the look of your dated kitchen cabinets or bathroom vanities. You can also refinish furniture with this stain. Easy-to-use, General Finishes gel stain is undoubtedly the best gel stain brand, as it involves little prep, and produces high-quality results. With kitchen renovations costing thousands of dollars, this gel stain is about $30 for a quart (a quart goes a long way). My only complaint is the strong smell, but a well-ventilated area solves this. When we moved into our new house, a lot of our cabinets were old oak originals from the 1970s. Our bathroom looked completely dated with an oak vanity. 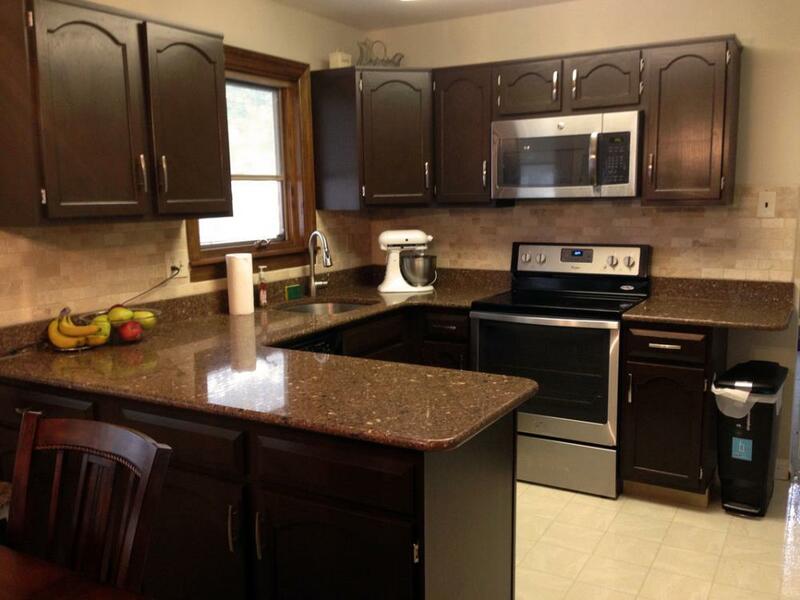 In our kitchen, the previous owners updated the countertops with granite but left the old oak cabinets. The speckled tan and brown granite clashed with the oak. I wanted a cost-effective solution, and at this point, I wasn’t quite sure how to do it. 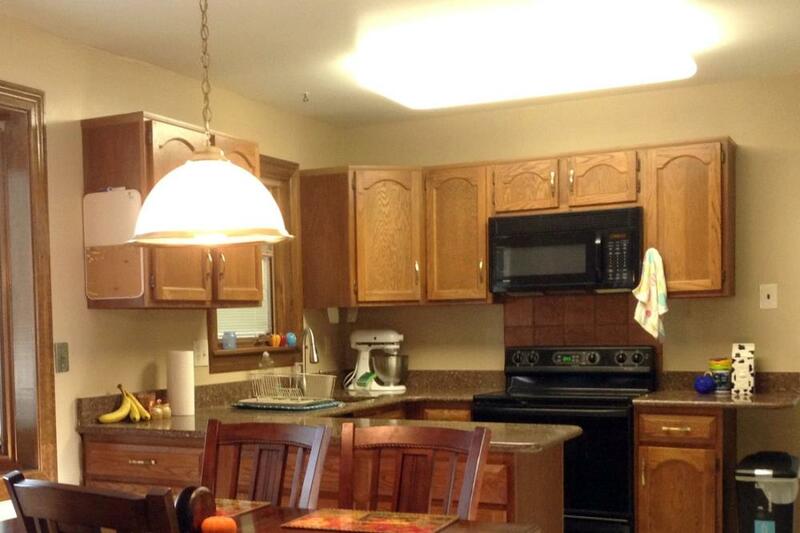 Here’s a picture of our dated kitchen. I couldn’t wait to refinish those oak cabinets with a much darker look. 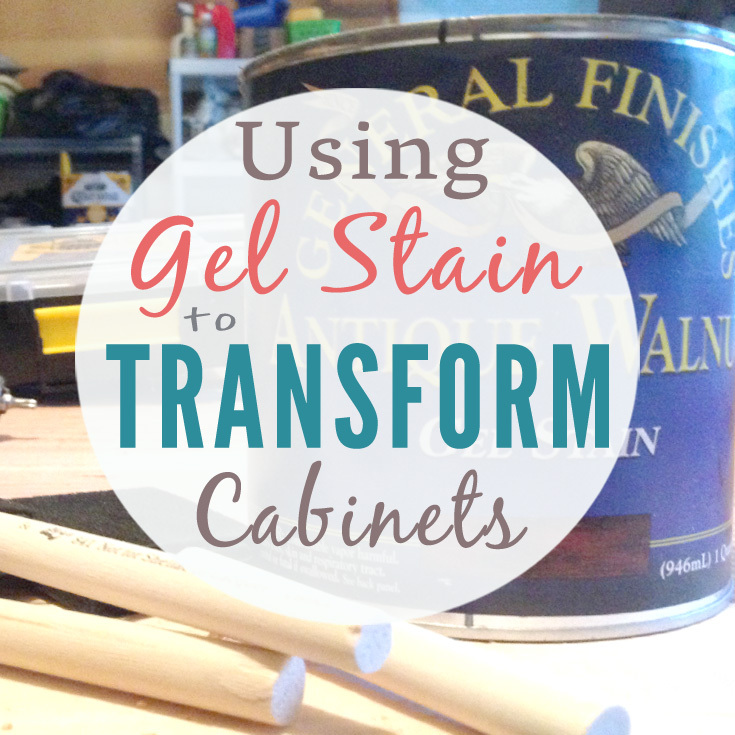 Spending time scouring pinterest and googling my options, I stumbled across a blog post where gel stain was used to completely change the look of a bathroom cabinet. The blogger recommended General Finishes Gel Stain and emphasized this was the best brand of gel stain. I had some time on my hands and decided to try the gel stain finish on the bathroom vanity. I started small – on the inside of the cabinet door. If I liked the way it turned out, I could go ahead and finish the cabinet. In the back of my mind I was thinking that if it went really well, I could attempt the kitchen. 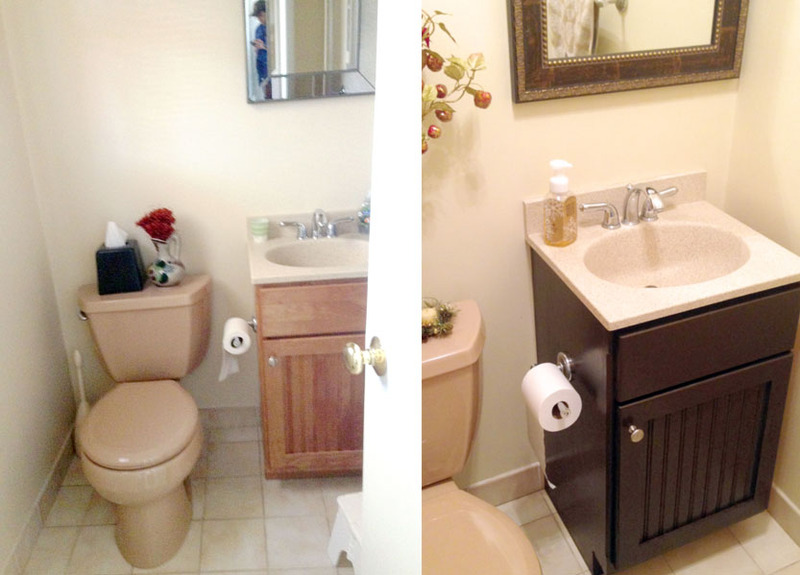 Below is a before and after of the gel stain used on the bathroom vanity. I was thrilled with how it turned out. Prior to gel staining cabinets, I had a lot of experience working with regular wood stain, but I had never worked with gel stain. However, it was easy-to-use and yielded exactly the results that I was going for. I was so thrilled with how the bathroom vanity turned out that a few months later, I gel stained all of my kitchen cabinets. It was a huge project, but the results were phenomenal, especially for the money. What makes gel stain different? To give a little background on gel stain versus regular stain, when using regular wood stain, or thin-liquid stain, it actually penetrates into the wood. Whereas with gel stain, the stain sits on top of the wood. When using regular stain, sometimes the wood unevenly absorbs the color and you end up with some dark splotches. With gel stain, you don’t have this problem because the wood doesn’t absorb the stain. Because it sits on top, it masks the grain of the wood, especially if you pick a dark color. When using gel stain, even though no uneven spots will show through, you will also lose some of the grain of the wood, depending upon how dark your stain is. This is a matter of preference though. General Finishes in Espresso is very popular color stain on the blogs. It’s so dark that is almost opaque, hiding the grain or any other imperfections. I thought Espresso would be a little too dark for my kitchen countertops. I went one shade lighter and used Antique Walnut. 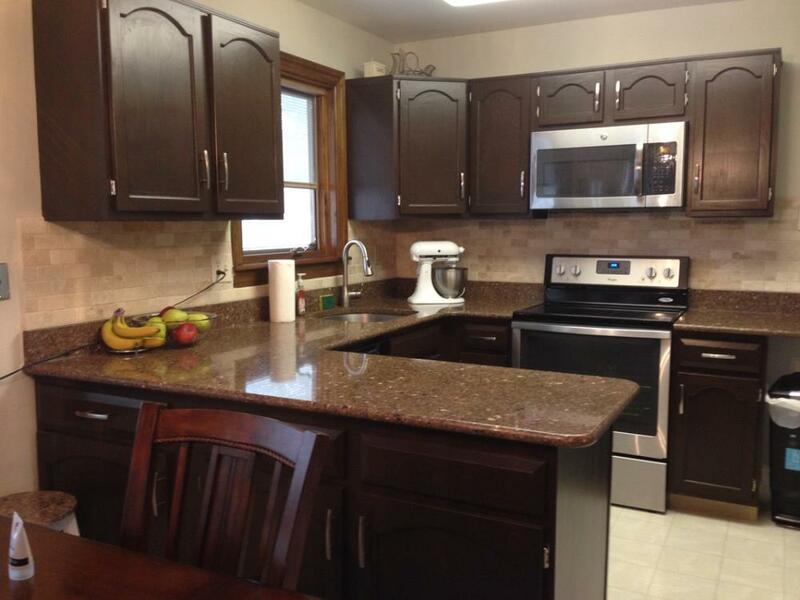 With this hue, you can still faintly see the grain of the wood, which makes the cabinets look authentic. When using gel stain, you don’t wipe off the excess stain the way you wipe off regular stain. It also is a thicker consistency and doesn’t really drip. This makes it easy to stain vertical surfaces. I haven’t even told you the best part – when using this gel stain, you don’t need to strip the wood or spend too much time sanding. You do need to do a thorough sanding, just enough to give the gel stain something to stick to. After sanding and thoroughly wiping down the pieces, I used foam brushes to start applying the stain. I preferred using the foam brushes (I used a regular size foam brush and a smaller size for crevices) rather than rags because I was wearing thick chemical gloves. So, I was able to get into the nooks and crannies with the foam brush more easily than with rags. The stain went on easy – just like painting. And again, there’s no need to wipe it off. I did three to four coats, and while it did look streaky during the first and second coat (it is supposed to), the third coat is magic. One thing you have to be careful of is leaving a build-up in the corners and grooves. These will harden and dry, and then stand out like a sore thumb. After each coat, thoroughly check the grooves and other areas for any build-up. 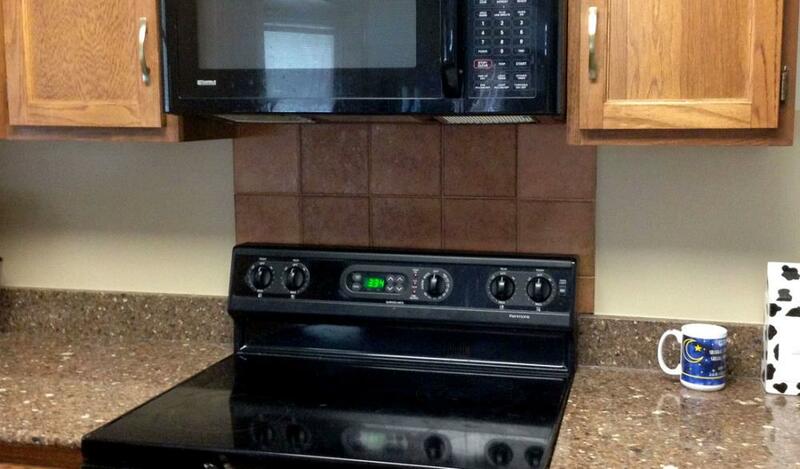 After three to four coats, the cabinets looked great. You can get by with three coats, but four seals the deal. There were absolutely no streaks or uneven surfaces. As far as color, Antique Walnut is a solid dark brown – like Hershey’s chocolate brown. As far as smell, the stain isn’t too pleasant on the nose. Make sure to keep your area well-ventilated. 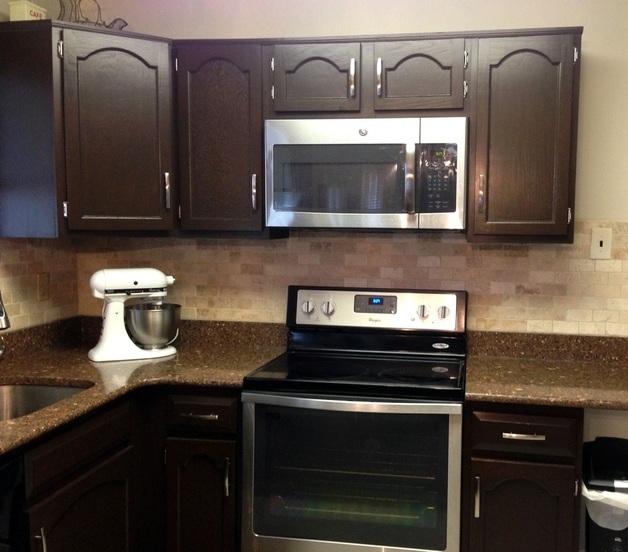 During this project, we added a cabinet to our kitchen, so we ordered two new, unfinished cabinet doors. I was worried about the gel stain looking the same on the unfinished cabinet doors – as the rest of the kitchen, where the gel stain was resting on top of an oak finish. I’m happy to report that the gel stain went on the unfinished doors easily and matched all of the old doors almost perfectly. The only difference is the two new doors looked a tad shinier than the other doors. In hindsight, we would have only used one coat of polyurethane. Because I put on thick coats, I went through three quarts of the General Finishes gel stain between the bathroom and the kitchen. Between the foam brushes, stain, and polyurethenane, the whole project was under $150. You simply cannot beat that! 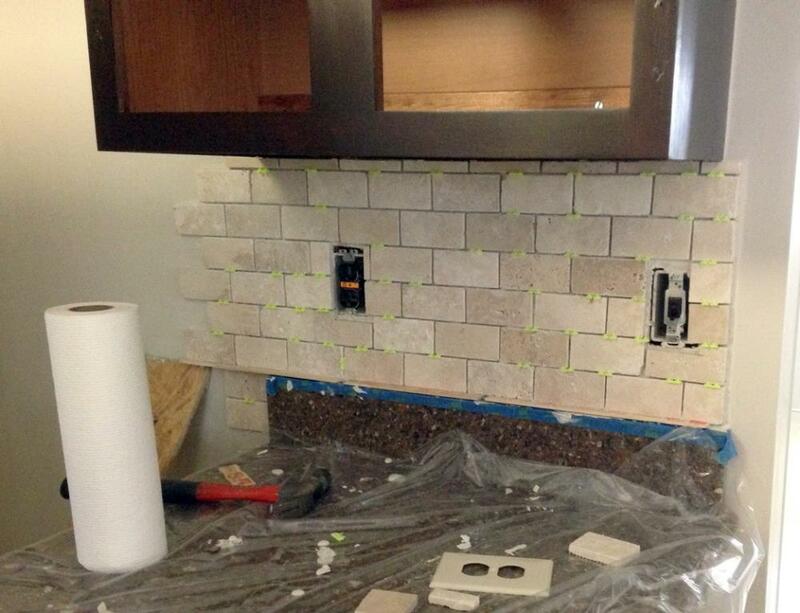 Kitchen renovations are thousands of dollars. If you are willing to put the work in, this is a fantastic solution. General Finishes Gel Stain is the only gel stain that I’ve worked with, but I heard it’s the only brand to work with. Ash used a different brand of gel stain with a piece of furniture years ago and ended up sanding the stain off. He was extremely skeptical of my desire to use the gel stain but was sold when he saw the bathroom vanity completely madeover. I’ve also read posts from other bloggers who have tried different brands and been disappointed with their results. Pictured below is Ash reattaching the cabinet doors. Where can I find General Finishes Gel Stain? General Finishes Gel Stain is a little hard to find – you have to buy it a specialty shop or on Amazon. We bought the first quart on Amazon and found the next at a speciality shop a couple hours away, due to poor planning on my part! Here are the projects where we’ve used this gel stain. 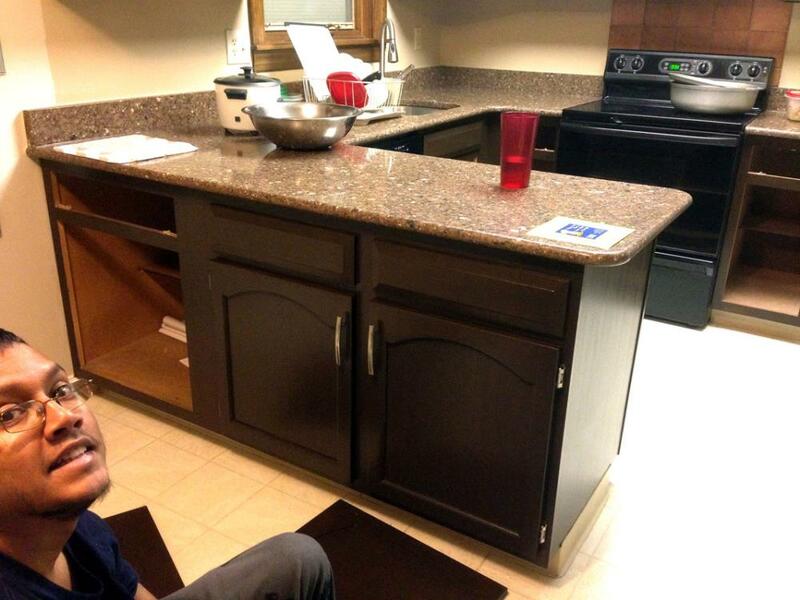 For detailed steps on how to gel stain kitchen and bathroom cabinets, click the project below. It’s been a busy holiday weekend over here. We didn’t go to the beach like most do on the Fourth nor did we see any fireworks this year (although hearing them was a different story). 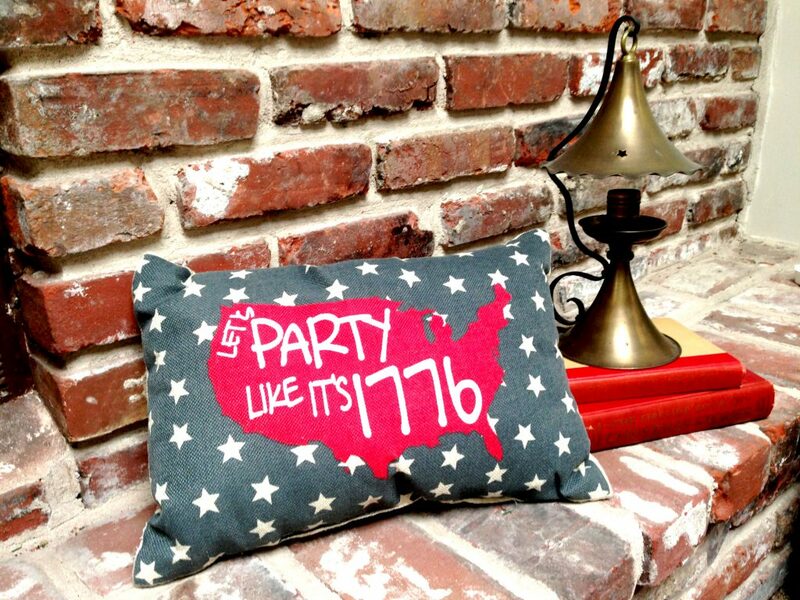 And, we certainly didn’t party like it was 1776. Instead, we got a heck of a lot done off of our DIY summer projects checklist. This was a long project, being that a lot of the work needed to be done in the room next to where our little one sleeps. With our downtime being his naptime and bedtime, the project was more drawn out than we had hoped. After taking the above photo, I caulked a few last spots and put the last coat of paint on the shelves. 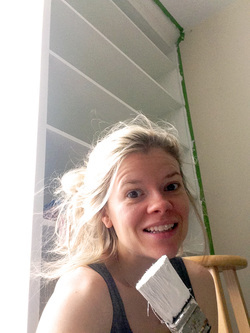 Here’s a selfie (or should I say shelf-ie) before I did some last few spots. I’m just so pleased the shelf is done. Not only is another project checked off the list, but we have about 12 boxes from our move stacked in our mudroom that are filled to the brim with books. We hadn’t unpacked them because we hadn’t a place to put them. So, now we can finally finish unpacking from our move. I’m so excited about that! (Now if only I could finish getting all of our pictures on the walls…). A Picnic Table in a Day? Just when I thought the weekend couldn’t get any better, Ash finished the picnic table that he started the same morning. 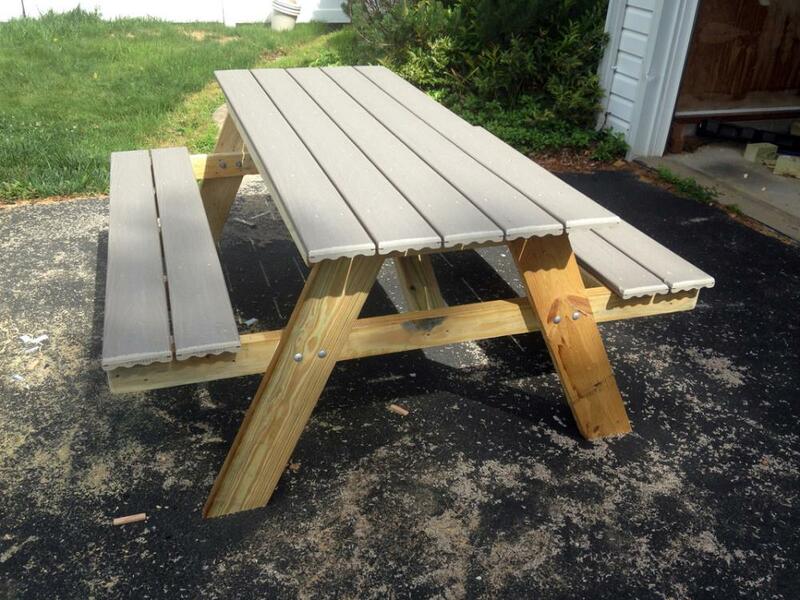 He built a picnic table in ONE day. Crazy, right?! ​And, his post tells you how you can too! And, the same evening, a perfectly-built, sturdy picnic table was in our driveway. But I shouldn’t be too shocked being that this is also the guy who single-handedly built a shed last summer. 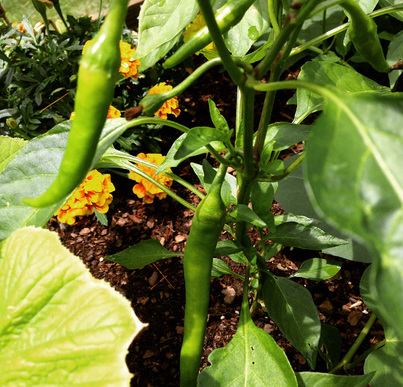 Our third item of the weekend was discovering vegetables in our garden! So exciting!! Ash and I have been together over a decade, and this is our first garden. This year, we have made a switch to clean eating and living a more healthy lifestyle. I have been living by Anthony William’s book The Medical Medium, which is all about healing our bodies through what we are eating. His information is life-changing, and he most prominently discusses just how amazing organic fruits, vegetables, and herbs heal our bodies. With our new way of life, our beautiful backyard, and Ash’s talent at construction, we decided to plant a garden this year. Ash built a DIY planter box as an early summer project. 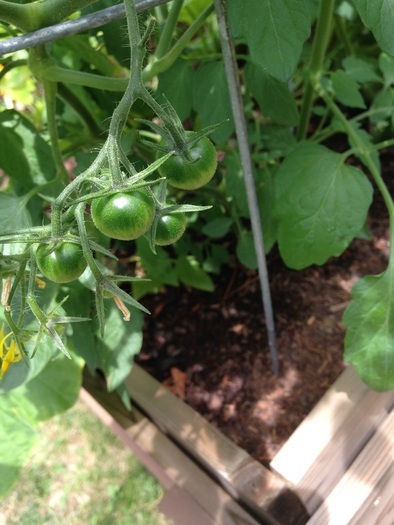 …then a few tomatoes, and finally some itsy, bitsy red and green peppers. It was a Fourth of July miracle! I can’t wait to keep checking it, let alone harvest our fruits and veggies! If our garden is a success, I might have to help Ash build another DIY planter box next year. The fourth, and last project we had happening this weekend (other than some yard work) was installing a shade sail for our very sunny patio. We were looking for a cost-effective way to throw some shade on our hot patio in the summer months, and we came up with this solution. 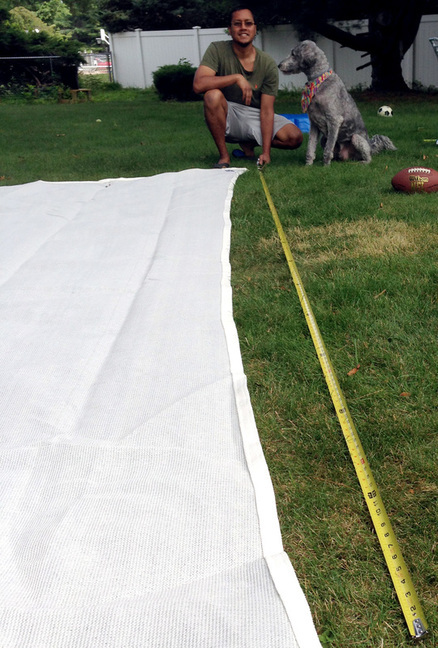 A shade sail is a weather-proof fabric that is held up by the house and a few poles. It appealed to us because it’s quite modern-looking and not permanently affixed to the house. We didn’t get too far into the project, but we will keep you posted on how it turns out (update – check out the full tutorial). We didn’t have a conventional Fourth of July weekend, but it was a great one. We spent some time checking off a few projects, starting a new one, and of course, discovering our homegrown fruits and vegetables!